Father Biagino, trying to look inconspicuous as if merely passing by upon some errand, approached the spot where the arch lector was about to receive the army’s scouts. Being a priest of Morr, one of the Viadazan crusaders no less, no guards thought to stop him. Anyone else would have been suspected of being a spy and certainly not allowed so close without an adequate excuse. The first thing that caught his eye was the formed company of soldiers standing guard, clothed in the blue and red of Remas, with a fluttering standard bearing the arch-lector’s crossed keys – the keys to Morr’s heavenly garden – before them. Despite the livery and the ensign, however, they were not Remans, nor Tileans, nor even worshippers of Morr. They were from the far, distant and mysterious realm of Cathay, being one of several such mercenary companies in Reman employ for many years now. He was not alone in thinking Cathayans were somewhat unexpected and unusual components of a holy Morrite crusade. Their role in the state army of Remas was widely understood: ever since the disgrace of the corrupt arch-lector Frederigo Ordini during the time of the Tilean Terror, when the secular overlord of Remas took command of the city’s forces to prevent any further folly, the army had been almost wholly composed of foreign mercenaries. This was hardly a novelty in Tilea, as many an Estalian caballero, ultramontane halberdier or Border Princes brigand archer were hired by many a city state. All these accepted holy Morr as the god of death, part of the pantheon of lawful gods, and even if their first prayers in battle might be to Myrmidia, Sigmar or even Ulric, it was the blessing of a Morrite priest they sought when mortally wounded. These Cathayans, however, recognised none of the gods known in Tilea, instead worshipping alien gods whose very names were unpronounceable. Back during Frederigo Ordini’s fall and the distrust of the church it caused, such foreigners were actively sought, all the better to ensure that a corrupted priest might no more bend them to his will, regardless of whether that will be loyal only to Morr or driven by worldly greed and a lust for power. And so the quiet Cathayans’ reassuring, and continued, presence in the Reman standing army had begun. But here, now, amongst a blessed army commanded by priests and half composed of willing volunteers and soldiers sent by the powers of Tilea, the Cathayans seemed out of place. But then, even a year ago no-one thought an arch-lector could command any army. 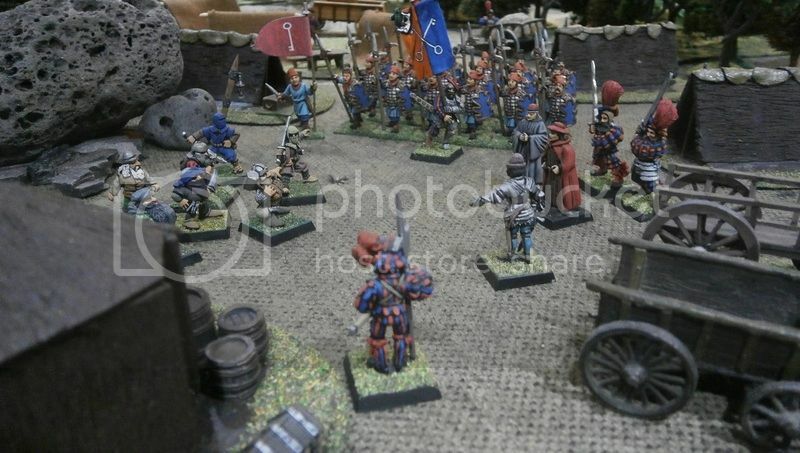 Once Biagino had found a spot where he might watch and listen without being too noticeable, he spotted the dwarfen scouts already making their way through the camp. While they approached, he looked over at the Arch-Lector Calictus II. Wearing his simple red cloak, and unadorned hat, with only a little gold-work upon his brown-belted cassock, it was the arch-lector’s face that drew people’s attention, then held it. Strikingly gaunt, his stern expression reflected both what he expected of himself and of others, while being visibly illuminated by Morr’s holy blessing (at least to those who had eyes to see such things). It dawned on Biagino that here was the answer. Calictus was the reason why Cathayans, ogres, dwarfs and all the rest were marching northwards together. Not his office and the authority granted by it, nor his robes and all the outward dignity of religious nobility, but the man himself. All who looked upon him saw a man they could trust to do Morr’s will. This arch-lector seemed as far from the cunning and conniving character of Ordini as one could get. It was the man Calictus who could command the secular state of Remas and all its forces, then lead them to fight a holy war, despite the disastrous false crusade of only 60 years previously. The passage of time had no doubt played a part in assuaging Reman doubts, and the undead nature of the foe proved the need for decisive action, but it was the man himself, devout and determined, who had finally tipped the balance. So it was that several forces were welded into one, men and brutes, foreign mercenaries and city militia, Remans and Pavonans. From the most able of genius artificiers, Angelo Da Leoni, who had brought his marvellous steam engine, to the most crazed of gibbering, flagellating fanatics, raised from the city’s poorest quarters by the raving priest Father Antonello. From the proud nobility of Remas bedecked in fluted and laminated armour from knight’s head to horse’s hoof, to the outcast peasant archers of Campogrotta in their mud-flecked, linen rags. All marching side by side beneath the banners of the Reman Church of Morr. And the dwarfs, of course, who had just that moment arrived before the arch-lector. They had been sent out along with a company of Bravi to learn what they could of the now nightmarish city of Viadaza. The bravi had returned with little to report, their faces ashen and limbs trembling, their words a confused tumble of prayers, warnings and whimpers. Biagino had learned at the Battle of Pontremola that men could face the walking dead and fight well, while priests sang litanies to heap blessings upon them, and holy paraphernalia invoked an aura of Morr’s protection. But if such things were absent, he knew from his own experience, then the fear engendered by both the sight and stench of the undead could sap all courage leaving an empty, choking pit where one’s guts were supposed to be. Biagino hoped the Dwarfs had not been so affected. The dwarfs were not alone, having more easterners with them: masked, bare-footed men with fine blades ridiculously rumoured to be sharp enough to slice paper in two (not in the normal way but by separating front from back to form two equally sized, impossibly thin, sheets). In any other army the sight of two such dissimilar warrior species working together as one would be the talk of the camp, but here in this crusade it was par for the course. Biagino noticed that one of the dwarfs also wore a scarf to hide his face. Odd, he thought. Maybe the fellow’s beard was too bright a shade of ginger and he didn’t want to reveal the scouts’ position by it? But then why was the white bearded dwarf not similarly wrapped? Perhaps the dwarf was so impressed by his eastern companions he had taken to dressing like them, an action that seemed more gnomish in character than dwarfen. Or did the fellow have some mutilation to hide, which in the case of a dwarf might be nothing more than an ill-clipped beard? He shook his head – it was lack of sleep that made his thoughts stray so wildly and easily. The dwarf at the front did the talking. He was clothed in chainmail, wore his beard in neat braids, and carried an iron hammer as big as a two pint pot upon his shoulder. Having bowed to the arch-lector in the quick and slight dwarfen manner, he began his report. Biagino wondered whether the limit of the enemy patrols was due to how far their vampiric master’s will could reach. “The patrols – they are undead?” asked the arch-lector, which Biagino took to mean that he too was weighing the same possibility. “Did they see you?” asked the arch-lector. Biagino wondered if the captain was related to the noble Duccio family, long famed for their philosophical bent. Perhaps he had come along with the Pavonans, Astiano’s new rulers? Perhaps the man had chosen to be just as philosophical about being conquered? “There’s not a wall unguarded, your holiness. I checked every one with my spy glass. A dozen at least upon each. 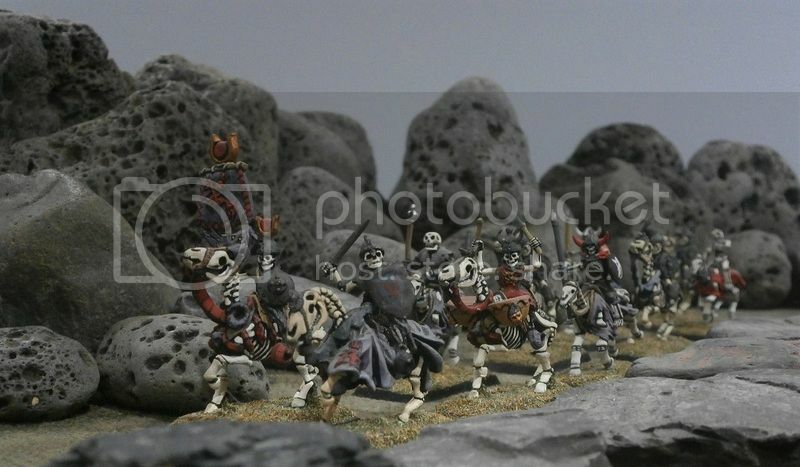 Some were skeletons armed with long spears, many armoured too. That’s the same as ever, thought Biagino. When Lord Adolfo was still mortal both the seaward and landward entrances to his city had always been guarded by Ogres. Now he was a vampire, why wouldn’t his brutes be zombies? 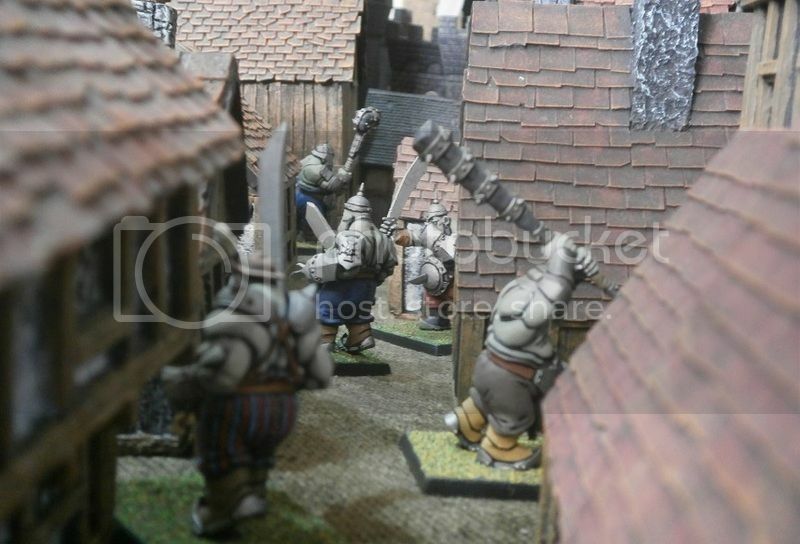 Biagino already knew to expect undead ogres at the city, for the fisherman had reported their presence to him. In truth, there was nothing described so far he had not told the arch-lector himself. He had written lengthy reports concerning what he himself witnessed at Viadaza and all that the witnessed he had questioned had told him. Except, of course, and somewhat crucial to the true picture, he could not say that all these things were still there. Until the scouts looked with their own eyes it was entirely possible that Adolfo’s main strength might already have moved elsewhere. This thought made Biagino think of his recent nightmares: Catching his breath after the victory at Pontremola, the cheers of his battered regiment as the enemy falls back. No-one has the strength to pursue them, but it is not necessary. The enemy is beaten. The vampire Duke is dead. The tide is turned. But then the dream changes and he is hiding with Ugo in the trees east of Viadaza, watching as the Vampire Duchess is welcomed into the city by Adolfo’s hellish army. Panic wells inside him. There has been no victory. Pontremola was a trick, an illusion. Even as the Viadazan crusaders cheer at the sight of the enemy falling away, in truth the enemy has already passed them by, and the city has fallen. Then the dream changes again, back to the army, except these are the Reman crusaders, and they too are ready to cheer, any moment. The enemy is about to retreat. His legs grow weak, his sword slips from his grip, for he knows if they do retreat, then it is the same as Pontremola - a hollow victory. The real enemy has already passed them by and is even now swarming through yet another town. For them, to die is to be undead, to be defeated is to be undefeated. His head swims as the macabre dance unwinds about him - feint, attack; fall, rise; lose, win - while his dancing Duchess partner manoeuvres him, step by lurching step, ever closer to the water. He jolted awake. The dwarf was still speaking. “'A good night’s sleep is the whetstone of success',” said the Viadazan captain, quoting some ancient scholar on the art of war. A good night’s sleep! thought Biagino. If only. Oooh! 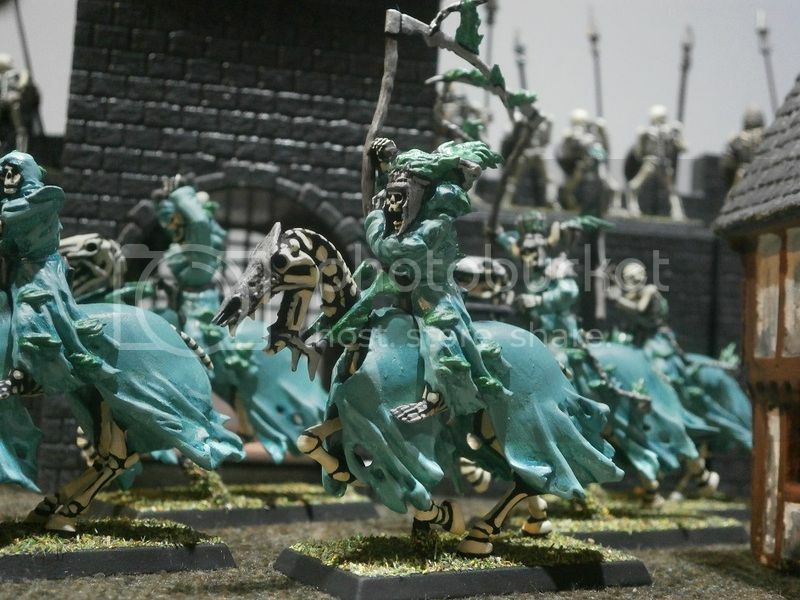 I like the new scary, green covered, skeletal cavalry! I love your style... I feel like reading some awesome narrative battle report, like they used to post in old WD's. Hell, that's so inspirational it actually made me paint a couple WFB models. Thank you very much for saying so, Xathrodox86. It really does help keep my own enthusiasm going if I know some people enjoy reading this stuff. The ground beyond the grey walls of Viadaza, out to the ancient ruins of a Morrite church and the rocky outcrops three hundred yards away, was empty of all buildings, trees, walls and hedges – cleared to ensure that approaching army would find no concealment. It was a common tactic, allowing the defenders plenty of time to rain bolts and bullets upon the foe. Viadaza, however, was garrisoned by the undead, who rarely attempted to employ missiles of any kind, and so either the clearing had been done before the city turned, or perhaps the intention was to force any attackers to look long upon the foul and terrifying garrison as they drew closer. Round and square towers studded the walls, and a large, earthen bastion studded with storm poles had been thrown up before the gate. Even if unmanned, the earthwork made any approach towards the gate considerably more difficult. 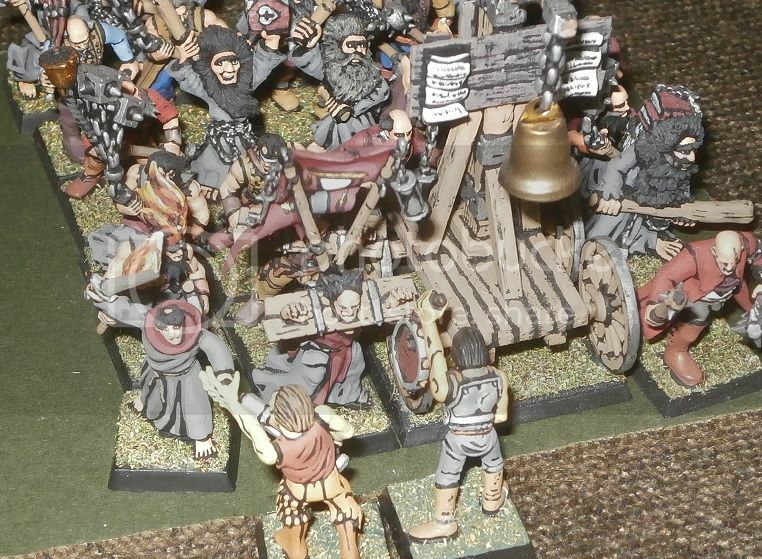 The Morrite Crusaders, however, had brought artillery, and intended to break down more than the gate - both the Pavonan and Reman master gunners had promised their heavy shot could, given sufficient time, bring down the walls and towers themselves. There were three large guns in the army of the living. Two were Reman, and stood amongst the main their own battalion upon the right and centre of the line. 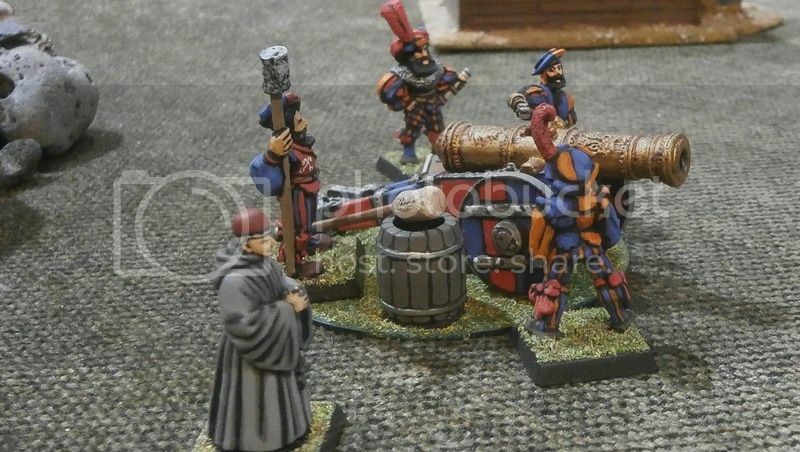 Father Biagino, who had once stood in the front rank of the Viadazan pikemen as they faced the undead in battle, this time stood alone, close to the artillery, very happy not to be in the vanguard this time. To the right of the guns rode the hero of Pontremola, General d’Alessio, leading the brightly armoured and prettily plumed nobility of Remas. Beyond them, upon the flank of the line, jogged a band of skirmishing bravi. The main marching strength of Remas was to the left of the guns. 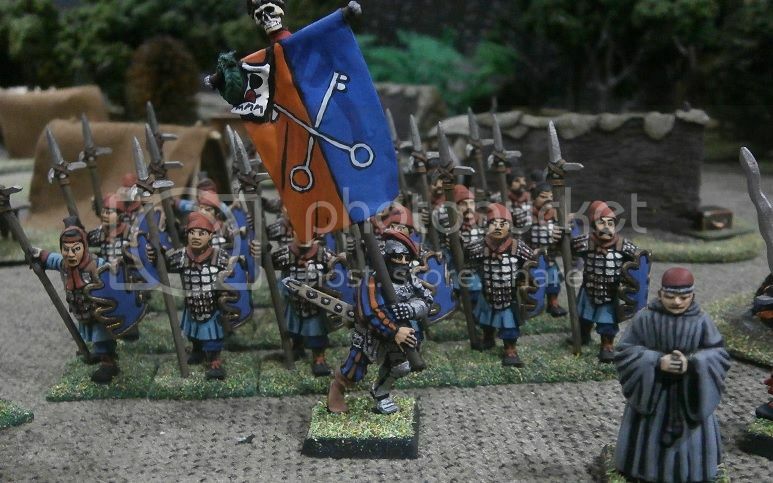 The large mob of flagellants could barely be held in line as they marched beside the column of pike and halberdiers. Behind them the carroccio trundled, from which jutted a huge banner bearing the arms of the Morrite church of Remas, while in pride of place at the very centre of the line of battle jolted Angelo da Leoni’s massive war contraption, its upper deck doors already pulled open to reveal the multiple muzzles of the helblaster within. Black and sooty steam belched from its long, central funnel as gears grinded and chains rattled. 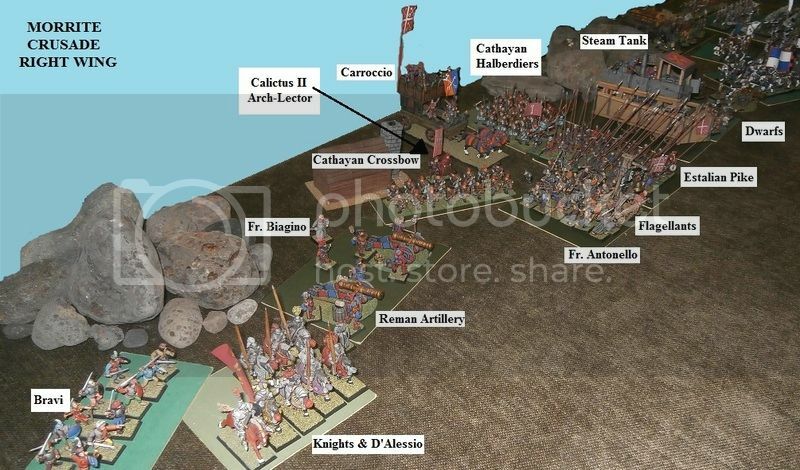 The left of the crusader’s line was composed of the other two battalions in the allied force: the blue and white liveried Pavonans, and the archers and grey-skinned brutes sent by Lord Nicolo from Campogrotta. Here, as well as another gun tended by its own engineer, there were handguns, bows, longbows and leadbelchers, all massed together and ordered to clear the walls before them of anything that moved. 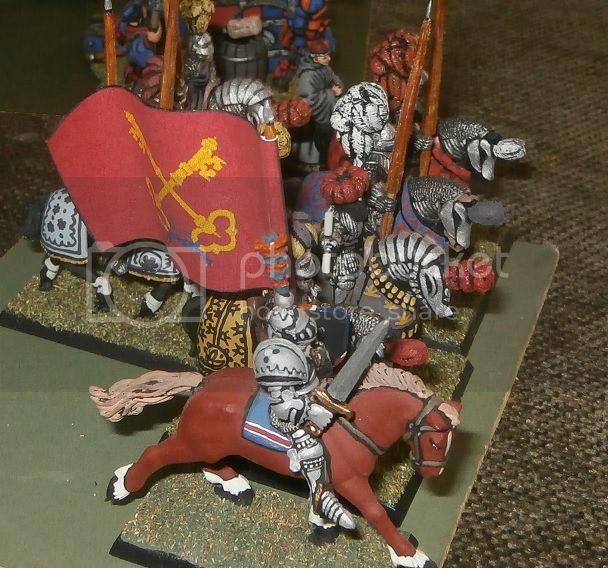 The young lord Silvano Gondi, the only horseman in the Pavonan battalion, had chosen not to ride with the Reman nobility and General d’Alessio, for it seemed to him only proper that he should personally command the army he had brought. So it was he rode amongst them. His armour was practically identical to that which his brother had been entombed in, for it had been fashioned in the same workshop at the same time. And like his brother, he sported a tall feathered plume so that all could spot him and recognise him instantly. He carried his lance couched beneath his arm, giving the impression not of a commander ready to issue orders to this company and that, but of a young knight about to charge headlong into combat. In truth, given even the slightest opportunity, that was exactly what he intended to do. 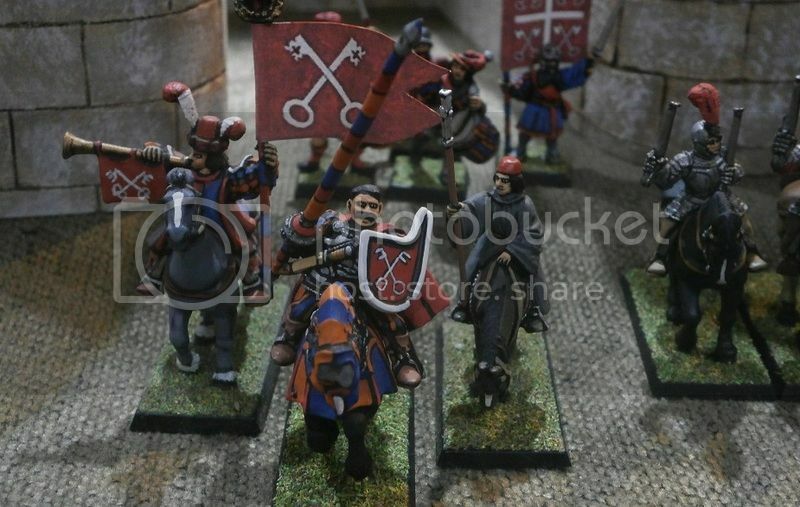 Behind the Cathayan crossbowmen, between an abandoned smithy and the blue and red barded draught horses hauling the carroccio, stood the arch-lector of Morr, Calictus II himself. The only guard he had was his personal standard bearer, present more to mark him out for his soldiers to see than to defend his person. He had declared that morning to his officers that the army was his shield and Morr his armour, thus it was a waste of sword arms to oblige any warriors to linger with him when there was Morr’s holy work to be done. In return, General d’Alessio suggested, therefore, that the arch-lector should stay at the rear, all the better to incant his magical prayers to embolden and protect the soldiers, without risking injury to himself. Calictus, wholly aware that his priestly life had in no way equipped him for the bloody press of a melee, did not argue. Father Antonello had a rather different take on things, however. All thought of prayer and priestly duty had gone from his head as he gave himself up to the same frenzied fury his fanatics were in gripped with. Leading them, standing at their front and right, he thus found himself furthest forward in the entire battle line. Not that he noticed, nor that he would he care if he had. The rotting, mindless servants of the vampire Lord Adolfo swarmed upon the city walls, peering and leering through the crenelated parapets. Gathered on the southern stretches of the wall, where Adolfo also lurked, were undead brutes, slavering ghouls and the animated bones of warriors who had fought and died at this very site many hundreds of years ago. 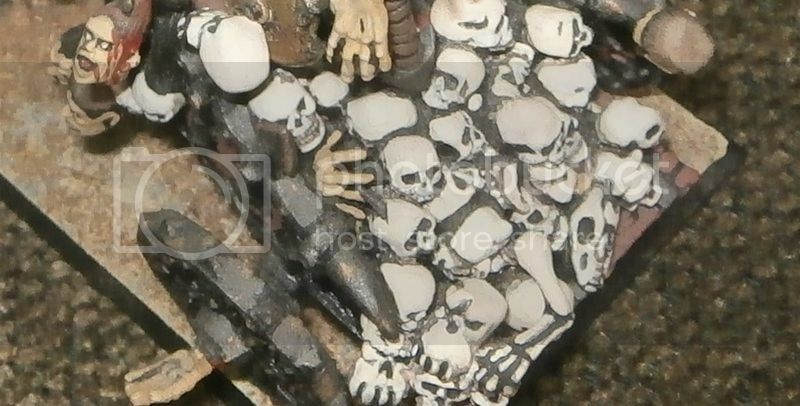 Along the northern reaches stood even more skeletons, hiding a necromancer amongst their number, while outside the walls stood a shambling horde of zombies – the recently living denizens of Viadaza who had failed to flee when dead arose. Although the height of the walls and the parapets upon them concealed much of the smaller foe, so that only spears and helmets, or bald heads and clutching hands could be seen clearly, none of the crusaders could fail to see the brutes guarding the gate and the walls about it. 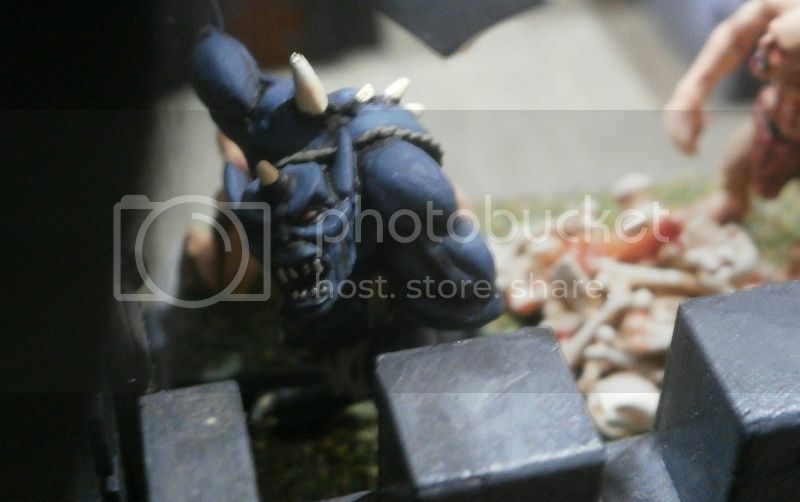 Their once grey flesh had mouldered into a bruised mess of blue, and was pierced through with snapped shards of bone. One had a huge cleaver dug deep into his skull, while the one upon the highest part of the gate bore a makeshift flail with threshing heads made of … well, heads. In the main street behind the gate a ghastly chariot rolled along, pulled by two long dead beasts. It carried a standard fashioned from what could only be a giant’s hand, and was not only piled high with skulls, but had skulls decorating every possible place such could be affixed. The charioteer was the part fossilised corpse of a warrior so ancient it had been the fashion in his day to share one’s grave with a chariot. He had been a head-collector in life, and those heads, even now containing the faint, whispering slivers of the souls they once belonged to, conjoined in their ages-old misery to conjure up a palpable aura of foul magic which cursed the very ground along which the chariot passed. Looks good i even remember it that way. Lets see if the rest is the same as my memory. @ damo_b: No pressure then? I have my notes, and about 80 photos to pick and choose from, so I reckon I will get this report spot on. It really helps when I can GM, take notes and photos, and not have to worry about tactics, decisions, moving figures and rolling dice. So .. thanks ever so much for stepping in and commanding the crusade. BTW, Craig did e-mail me to say thank you to the player who commanded his force! As was both proper and expected, it was Generalissimo Urbano d’Alessio who gave the command for the assault to begin, drawing his sword and sweeping it over his head to point at the walls. Drums and cornets began to sound the preparative, growing more numerous and thus louder as new musicians joined in across the line of battle. The mules and nags in the baggage train reared and jolted in fear, not because they were unused to the beating of drums, but because the field had been so quiet only moments before. When the first blast of the artillery added to the noise – for it had been agreed that before anyone moved the artillery would begin its bombardment - it was all the handlers and wagoneers could do to stop the horses breaking their collars and snapping the yokes. 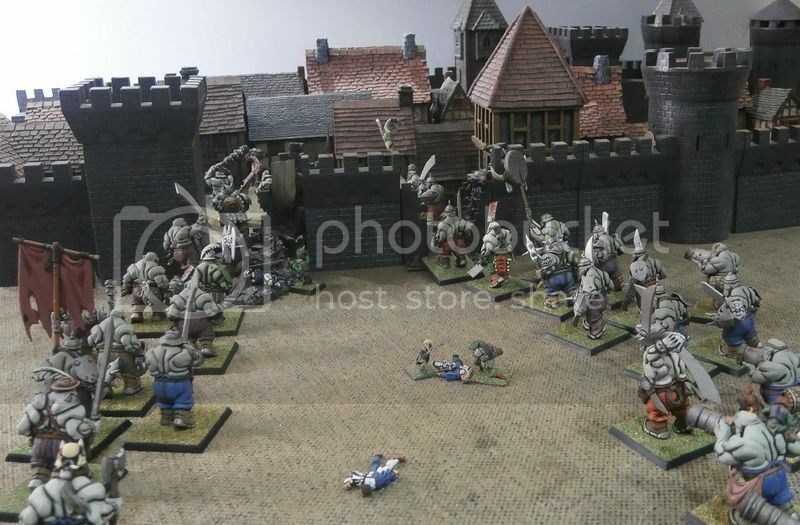 It was intended that the steam tank and the ogre lead-belchers would move as soon as the first signal was given, closing near enough to the walls to add their firepower to that of the big guns. 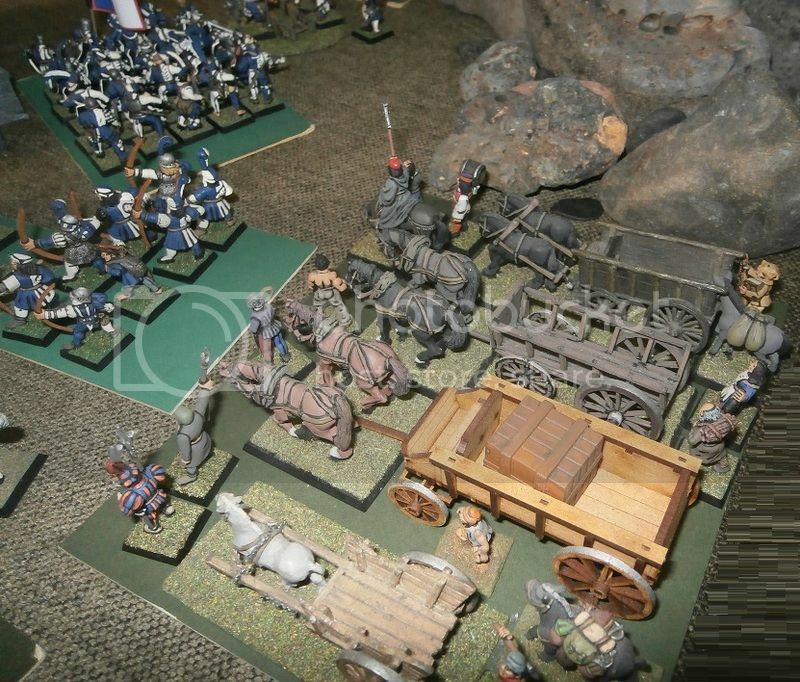 Accordingly, in the very centre of the line, Master Leoni’s iron and timber behemoth juddered and lurched, but then (although the sound of it was unheard by most of the army due to the thundering of the guns) it began to groan dangerously loud. Desperate to avoid calamity, Leoni was forced to vent the steam. As clouds of boiling vapour burst from the funnels, he knew his pride and joy would not be moving just yet. It was a rather inauspicious start to his military career. Calictus II had already spotted the large mass of zombies milling outside the city’s northern walls. Reluctant to allow the entire right wing of the army to be distracted and weakened by the need to hack through such a stinking horde of walking corpses, he conjured his Circlet of Burning Gold to make them stumble and struggle even more than usual, satisfactorily thwarting their advance. 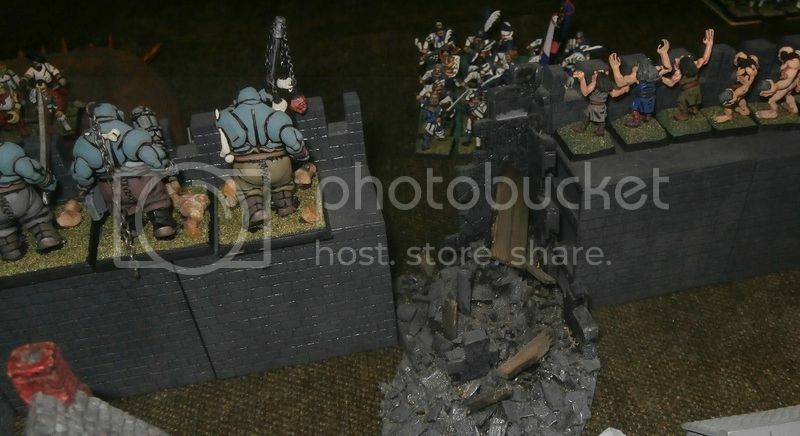 … and loosed a barrage of lead and iron, they too were surprised to see only one ghoul tumble back from the parapet. Most of their shot merely peppered and chipped at the walls. The sound of the blasts now dissipated, the echoes rapidly diminishing, to be replaced by a booming, staccato laughter emanating from the wall by the gate. It was one of the undead brutes, renowned for his bellowing voice in life, and now proving that death had not stripped him of his capability. When the horde of zombies failed to appear around the north-eastern tower as intended, Lord Adolfo’s lieutenant, a necromancer of considerable skill, realised some curse must have been employed against them. Undismayed, he simply decided he would raise some more. So it was that a newly animated company of corpses lurched to their feet and began their own stumbling advance right before the enemy. Not willing to allow the ineffectiveness of the artillery to dishearten the army, d’Alessio ordered the general advance. 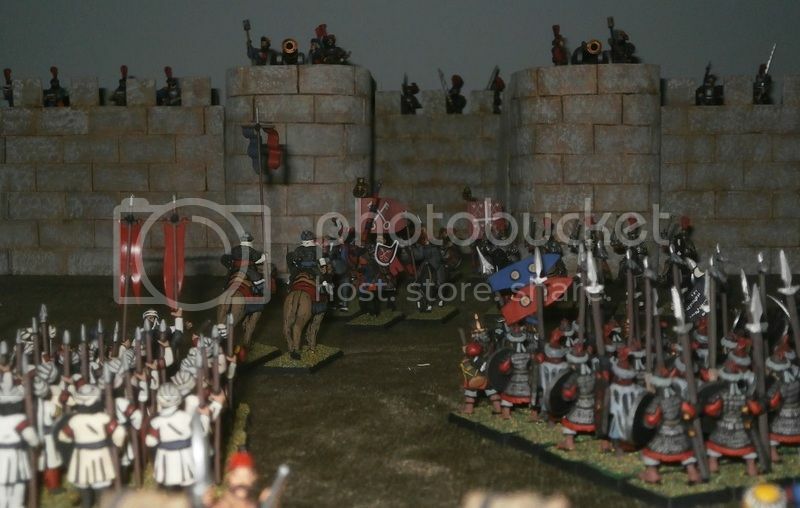 Praying to Morr, Master Leoni shouted instructions down to the engineers below – open that, release this, pull the other – and now his engine of war did move, clattering along beside the huge regiment of Estalian pikemen as they marched on apace. Although Calictus’ next use of the circlet was successful, an eddy in the winds of magic disturbed his concentration, and all enchantment was subsequently sapped from it. He knew it would be useless for the rest of the fight. The very same eddy proved too slippery for the lesser priest, Father Frederico, too. His Ruby Ring of Ruin sent a fireball to fell two zombies, but then suddenly grew mundanely cold as it too failed to preserve its magical aura. Both priests soon forgot these particular frustrations as they watched two round-shots once again fail even to shake the walls. A third shot, sent from the Pavonan piece, did at least splinter the gate’s timber. Those who noticed (which was not many) decided this might mean the guns could yet contribute to the struggle. 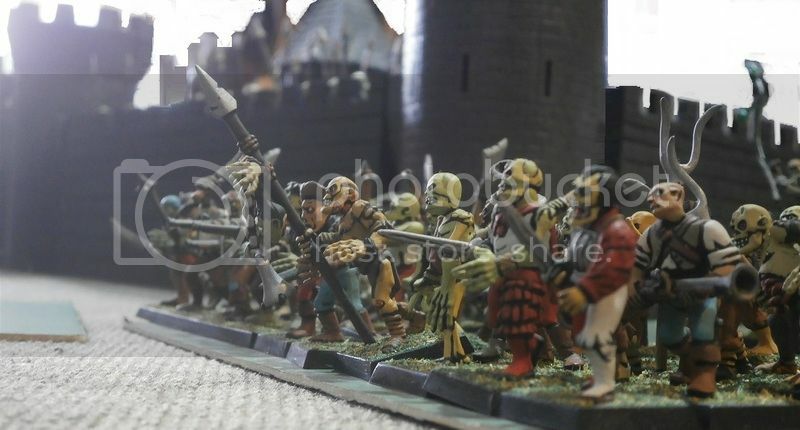 Cathayan crossbow bolts felled three of the newly raised zombies, while the cloud of missiles spat out by the leadbelchers and longbows threw only two more ghouls from the parapet. The other ghouls, leering intently over the walls, their horribly bent forms twitching as their black-clawed fingers scratched at the stone, had obviously not even noticed the deaths. On the northern side of the city a hideous band of hexwraiths burst from the walls to begin riding up behind the magically slowed zombies. Both the vampire Lord Adolfo and his necromantic second in command cursed as they could find insufficient winds of magic to unleash any effective spells, perhaps the result of the same eddy that had so unbalanced the enemy’s priestly prayers? 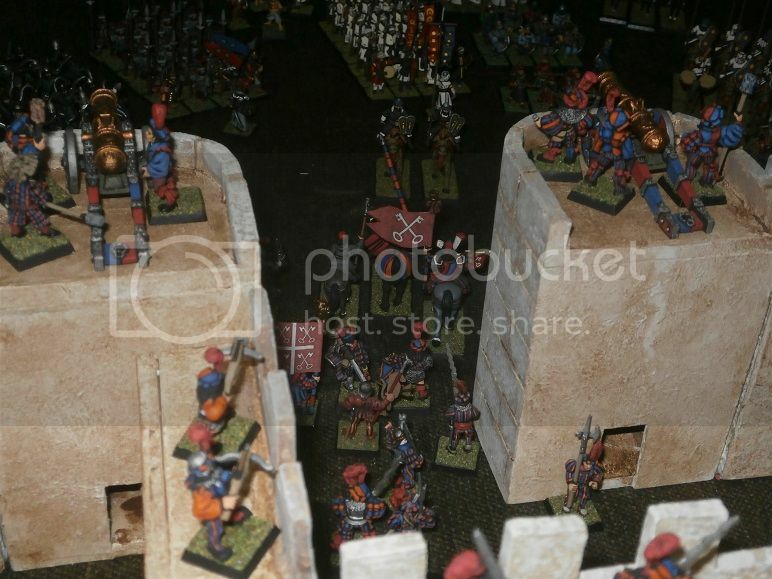 All they could do was watch as the enemy came on, the massed foot regiments at their centre taking the lead. Adolfo could not know, but the appearance of the hexwraiths did at least have an immediate effect on the foe, for Generalissimo d’Alessio and the nobility of Remas forming his guard thought better of riding any closer to a deadly foe they could not possibly harm. So it was they slowed their already slow pace, awaiting events to see if there was anything of use they could contribute to the assault. 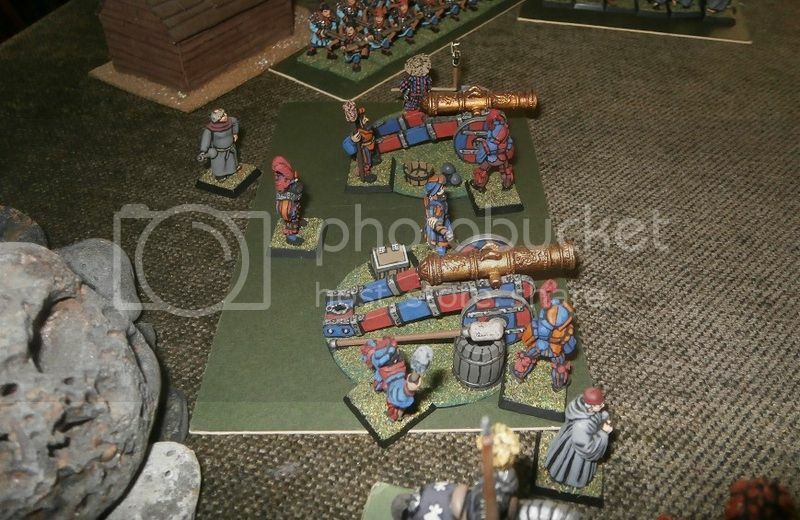 Three more blasts came from the cannons, and this time one of the brace of Reman guns blew itself apart in the process. For the sixth time a ball of iron bounced from the northern stretch of the wall, making several of those who witnessed wonder whether there might be some enchantment upon the walls. Perhaps they had been bathed in a necromantic concoction of sacrificial blood lending them some new magical of strength beyond that gifted by mere stone and mortar? Or perhaps great, thick piles of earth had been thrown up behind the walls, giving them a very mundane sort of strength? A good many men now began to wonder if they were marching headlong to their doom, for the thought of having to climb ladders to face such a terrifying foe was not exactly a happy one. Just then, however, another ball hit the gate, and this time huge shivers of timber were seen to break away as the shot tore right through. Maybe the gate would be broken? Maybe they would walk in fully armed rather than be forced to clamber up ladders with only swords and knives as weapons? Even as Master Leoni was leafing through his leather bound notes and calculations concerning the technical intricacies of his ingenious invention, once again the awful groan issued from its workings, this time sending a measuring rod to full extension. So once again he was forced to haul upon both venting levers, whilst shouting as best he could over the noise to instruct the engineers to open the fueling hatch and loosen the pressure grate. The machine slowed to a halt, and Leoni, in truth more baffled than embarrassed, now took a moment to ponder, his book open in his palm, hoping that inspiration would strike and he could think of some way to make the machine behave. Again the hail of missiles hurled at the walls felled only a handful of the foe, while the contrary winds of magic ruined yet more magical artefacts. The priests knew that they would have to put their faith (rather appropriately) in prayers, rather than rely on enchanted trinkets and baubles. 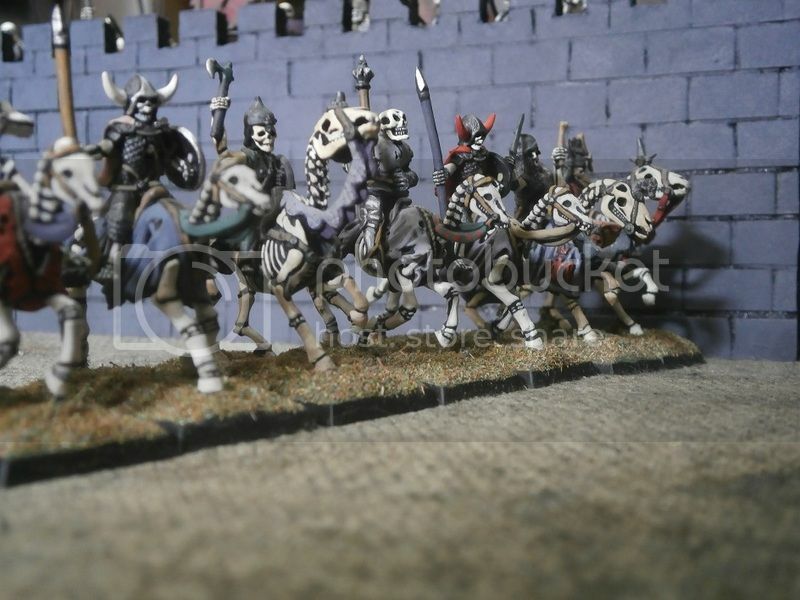 Now more undead riders appeared, trotting out of the southern walls as if it were no more difficult to do than leaping over a ditch. Once they were the disciplined bodyguard of an ancient warlord, and their training seemed somehow remembered as they wheeled neatly, maintaining almost (or entirely?) unnaturally good order, and began their own leisurely ride towards the foe. Adolfo found magic enough to restock his slightly damaged company of ghouls, while his necromancer glanced over to see that at last the huge mob of zombies had broken free of whatever it was had been slowing them down. They shambled forwards, hefting rusted swords and empty blunderbusses, bent pitchforks and damp pistols, chipped spears and maces. 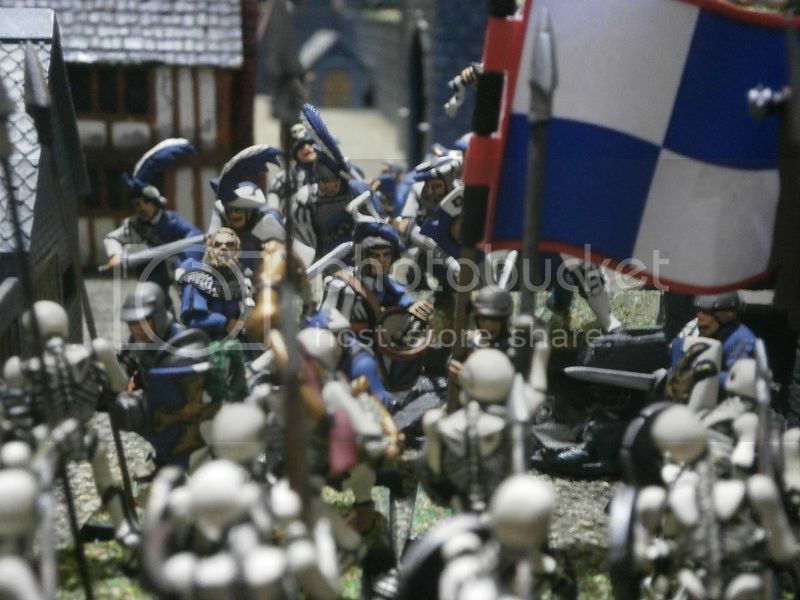 Upon the other side of the field of battle, the soldiers of Lord Silvano’s Pavonan battalion were keen on showing the Remans that they would not be laggardly in this fight. They too approached the walls, their swordsmen aiming towards the gate while the halberdiers marched straight towards the walls. 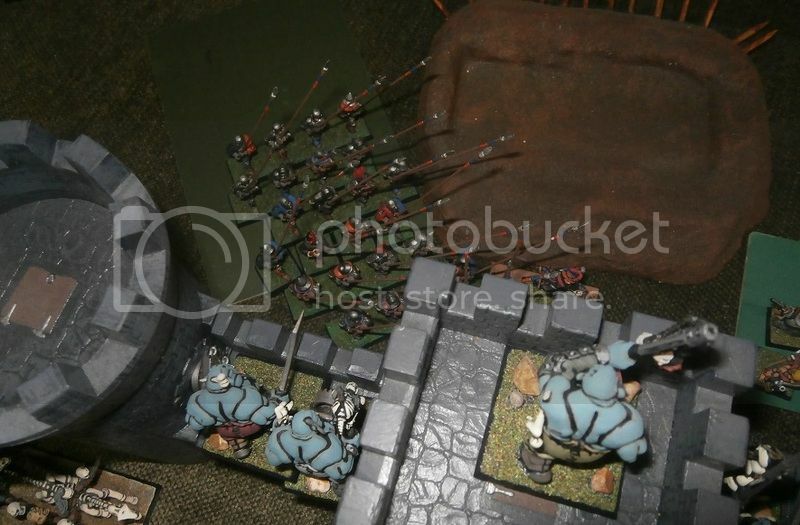 Beside them the Campogrottan Ogres continued forwards, the leadbelchers leading the way, hastily loading their pieces in the hope of delivering a hellish blast at the undead riders. When they did shoot, however, only one foe went down, while the other riders seemed only to have been awakened to the Ogres’ presence. Their empty eye sockets turned to look upon the brutes, then they pulled at their reins to turn the mounts too. In the centre of the Crusaders’ line the pike picked up the pace, skirting the empty earthwork and very definitely making for the gate. If (when?) it did finally break, they wanted to be ready to attack immediately. And they proved to be in luck, for just then another Pavonan roundshot smashed into the timber, this time tearing it down and breaking down the portcullis behind too. The way into Viadaza was now open, and apart from a cannon and its crew, the forces of the crusade had not lost a man. 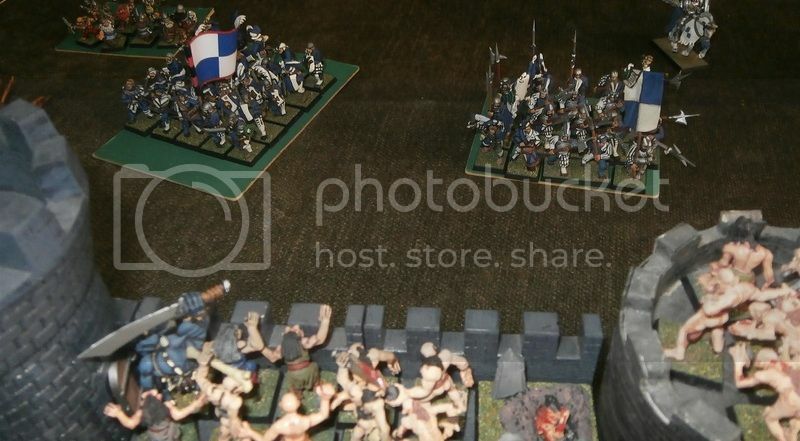 Up on the walls, Lord Adolfo wove adroitly through the fidgeting ghouls to find a better spot to sight the foe, and one from which he could cast magic to aid his horse soldiers as well as the defenders upon the walls. As the gate splintered and fell, he glared over the parapet, his red eyes gleaming with hatred, fangs bared, and he began to ponder whether he could hold this city, or whether it might be best to leave and return to his mistress. It seemed to him that a fight to the death meant that she would lose both Viadaza and this army, whereas if he could escape with some sort of force, then only the city was lost. His loyalty to her was paramount, and ultimately informed his every decision. For now, however, he put any thoughts of flight from his mind, for his blood was up, and a fury knotted every muscle in his body. This city had been his in life, and was still now his in death. He would try this fight a little longer, for his army was still virtually whole, and he would have it tear deep into the foe before he chose to yield his city. If he was to leave and flee to his mistress, he intended to tell her he had left the enemy wounded, reeling and afraid. 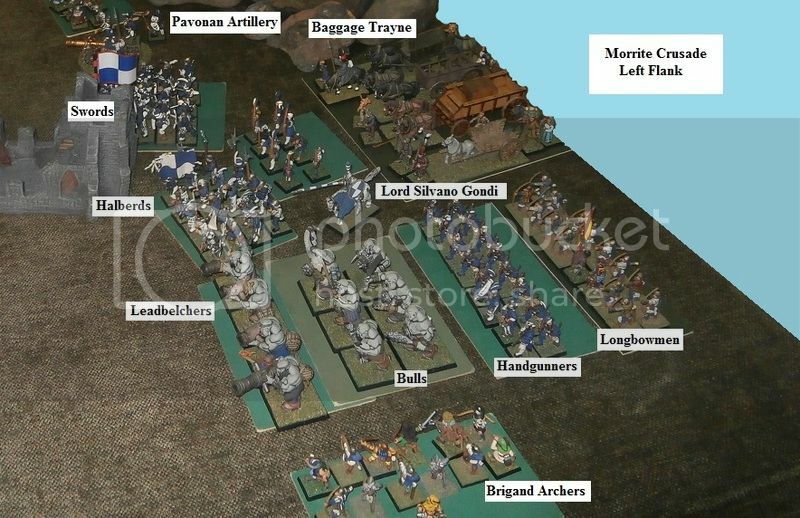 I notice 'Razger' doesn't mention the poor brigand archers as being his. It's almost as if he cares not a jot for any of the humans in his master's realm. Mind you, perhaps he learned that attitude from his master? Is that big blue guy a converted Strigoi? I know I've seen him somewhere. Anyway, awesome as always. The battle has just barely been joined, the undead are in motion, the missile fire effective to a degree, the lumbering warmachine struggling, and who will win remains to be seen. @ Xathrodox86 - He is! 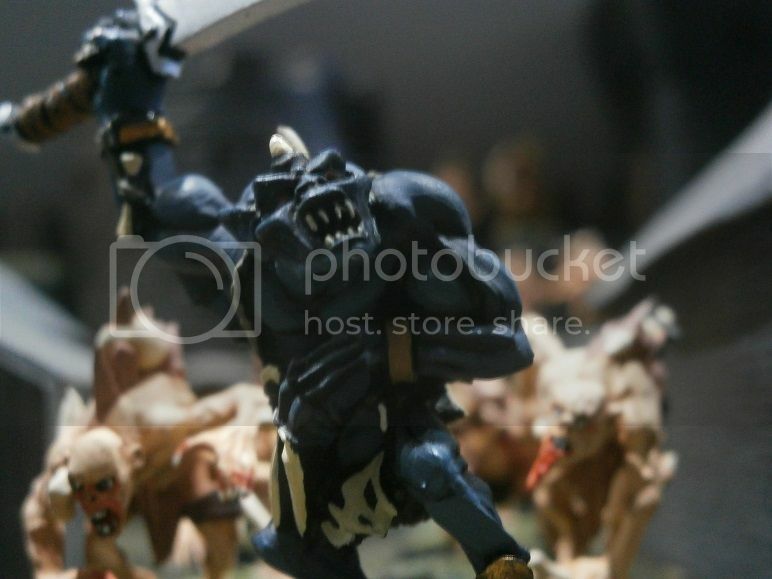 Simple conversion - I chopped one hand off and replaced it with an ogres' hand carrying a massive sword. @ GP: You will now find out! A hail of missiles poured against the upper reaches of the southernmost walls, bringing down three ghouls. The volley gun on the upper deck of the steam engine fired low and so merely left a ragged patch of indentations in the stone. Immersed in calculations regarding the workings of his machine, Master Leoni was entirely ignorant of how badly its opening shot had fared. Now came the first charges, not delivered by the crusaders but against them. The last two surviving zombies of the newly raised pack ran into the flagellants. One reached for Father Antonello, only to lose its outstretched arm when the priest’s sword came down with furious strength. Of course, the maniacal Morrites made short work of the last zombie, and with such ease that those in and behind the third rank had no idea any sort of fight had even occurred. … their spear tips and ancient blades finding their marks with uncanny accuracy, so that one ogre fell and the rest were bloodied. In return, only one rider was dispatched, and the surviving ogres, confused by the unexpected brutality of the onslaught, turned to flee. Finding the ogre bulls immediately behind them they faltered, a momentary lapse that allowed the riders to cut down the last of them. The riders then leaped over the twitching corpses and slammed into the bulls. Although surprised to discover the foe suddenly so near, young Lord Silvano of was determined to prove to his veteran soldiers he was worthy of not only their obedience but also their respect. He lowered his lance, gripped tight upon his shield, and spurred his mount to charge into the skeleton riders who had just engaged the ogres. 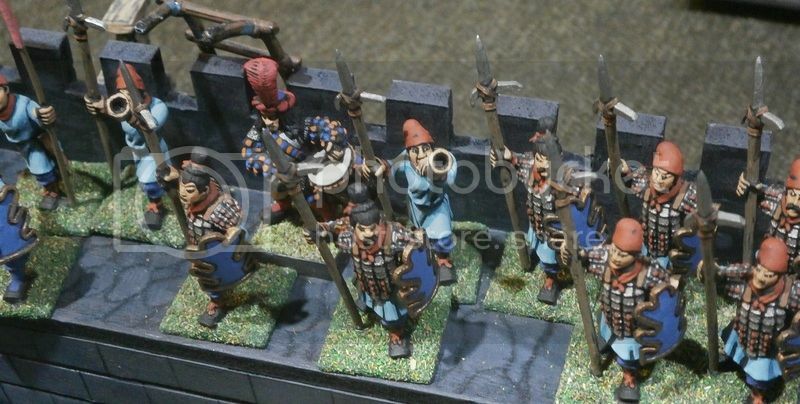 Silvano’s halberdiers, still marching towards the city and wondering how in any god’s name they were supposed to assault a wall defended by a foe as vicious as ghouls, now had something else to worry them. They had been present when Lord Polcario, Silvano’s older brother, had perished upon the walls of Trantio in the doubly fatal duel against the tyrant prince Girenzo. Now here they were as the Duke of Pavona’s last surviving son, a stripling who had yet to fight any foe at all, never mind face horrors from beyond the grave, had entered deadly combat. None of them wanted to be upon the receiving end of Duke Guidobaldo’s angry grief if the lad died. Their sergeant, ashen faced, screamed at them to wheel left. The assault would have to wait. One or two amongst the body, although they would never admit it, were actually glad of the distraction, for it may well mean they would no longer have to climb the walls to their almost certain deaths. 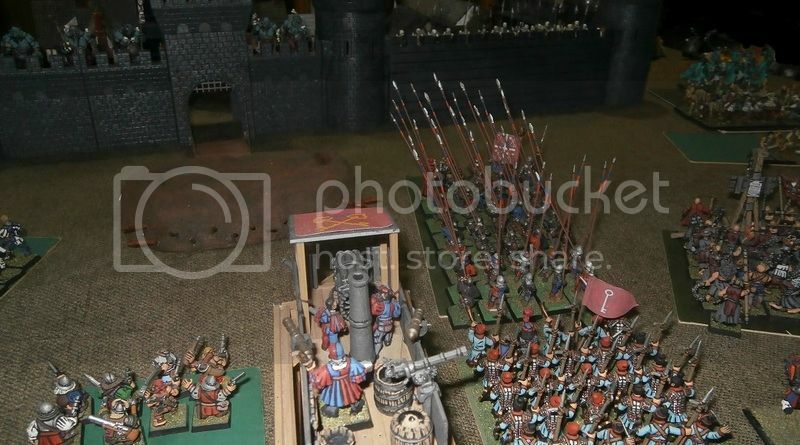 In the centre of the field, the Estalian pikemen were closing upon the gate, and their captain was considering how exactly he could form the body so as to get through. In the front rank was the Morrite lector of Viadaza, Bernado Ugolini. How strange, he thought, to be approaching the gates of his own city as an attacker. When the city’s new stench came wafting through the open port, however, it very horribly reminded him of what exactly Viadaza had become, and why such destructive a cure was necessary. Glancing up he saw an undead brute glaring down at from the parapet, and so he quickly channelled Morr’s Stare with a holy prayer and sent the foul creature toppling from the wall. 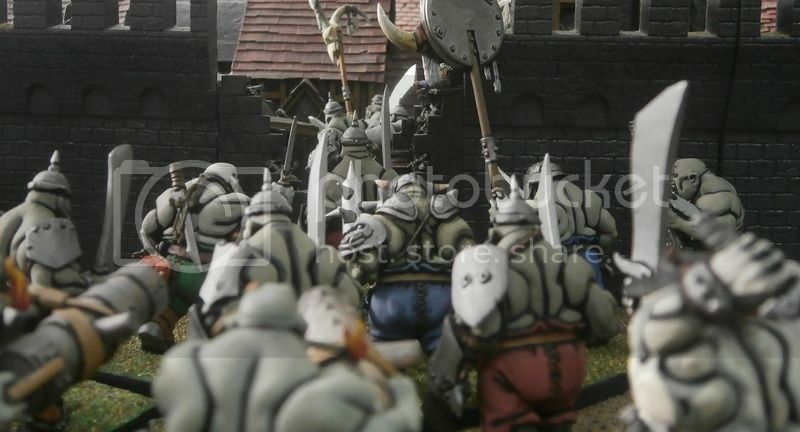 Aware of just how close the Father Antonello’s flagellants were getting to the huge mob of zombies, the arch lector Calictus II began chanting the words to the prayer Morr’s Caress (Game Note: The Morrite priests are modified versions of 8th ed Priests of Sigmar, but with home-made prayers.) He felt the power of Morr flow through him, and knew that the Zombies would now be weakened. Faced with the flagellants’ fury and flails, that weakness would surely mean their imminent demise. 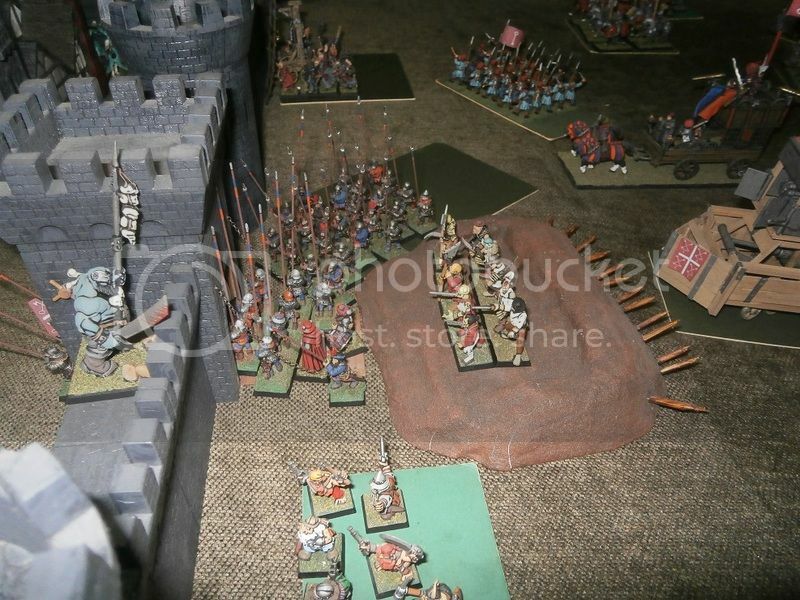 Once again a vast volley from the left wing of the crusade resulted in the deaths of a mere handful of the foe, the sturdy stone walls proving a considerable hindrance. 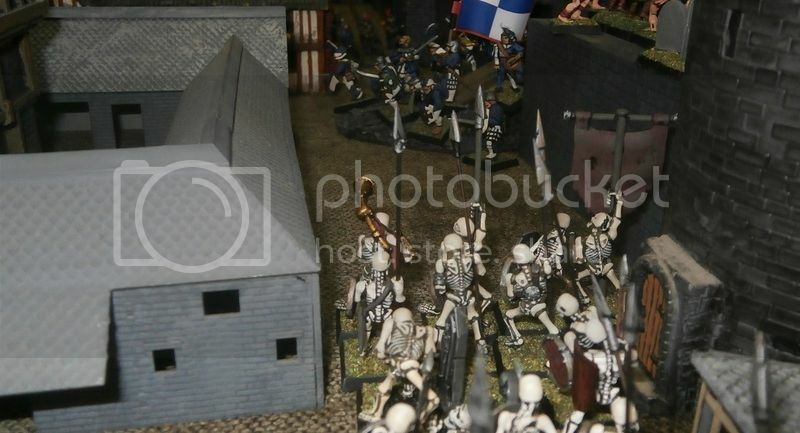 Not that those doing the shooting were keen to try some other form of attack – prolonged shooting and aching arms was much preferable to close proximity to a foe at one undead and deadly. This time the steam engine’s volley gun did fell a ghoul. And this time Master da Leoni noticed. His brow furrowed as he recalled the promises he had made concerning how well his costly machine of war would function in battle - much more than the equivalent of a lone hand-gunner’s lucky shot. Putting his book down, he strode over to the volley gun and took closer command of the crew. Lord Silvano’s lance lifted the skeleton horse champion right out of his saddle and sent both his and his mount’s shattered and parted bones tumbling. When the ogres felled two more, the shock was sufficiently strong to un-weave some of the magical threads animating the ancient warriors and cause two more riders to collapse. Over on the far side of the field, the flagellants had worked themselves into such a furious fervour that two of their own number perished in the mayhem. They cared not, and as they smashed into the horde of undead before them they released a truly terrible torrent of iron-bound blows. Upon the wall, the beast that Lord Adolfo had become, his vampiric from made bestial by the taint of orcen blood in his veins, invoked dark magic to heal his riders, re-knitting the mounted champion’s bones back together so that in a moment he was back, sword in hand, facing the more than a little surprised Lord Silvano. This confusion threw the young lord, and as he now set about attacking the champion for the second time, all his blows failed to land. Nor was he the only one struggling, as by his side another ogre was cut down. Although some riders were felled by the remaining bulls, many of them for a second time, it was clear that the fight remained in the balance. The watching Pavonan halberdiers now knew with sickening clarity that their young general was caught in a fight which, if the vampire Lord Adolfo employed sufficient magic, could through longevity alone prove deadly. 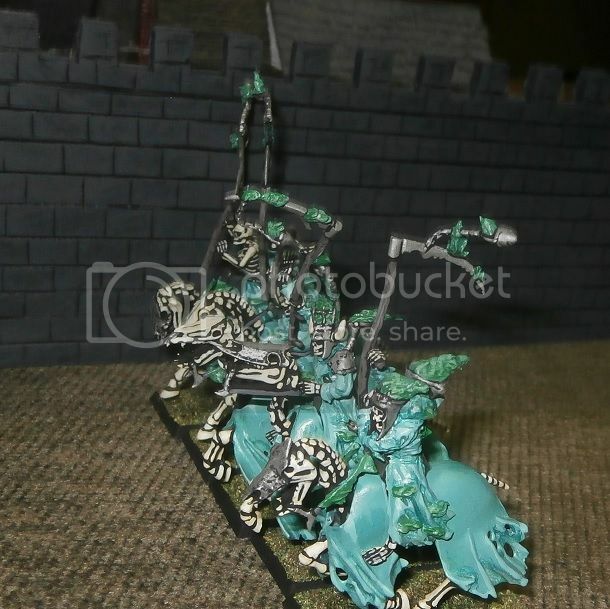 So without pausing they charged into the skeleton riders’ flank. 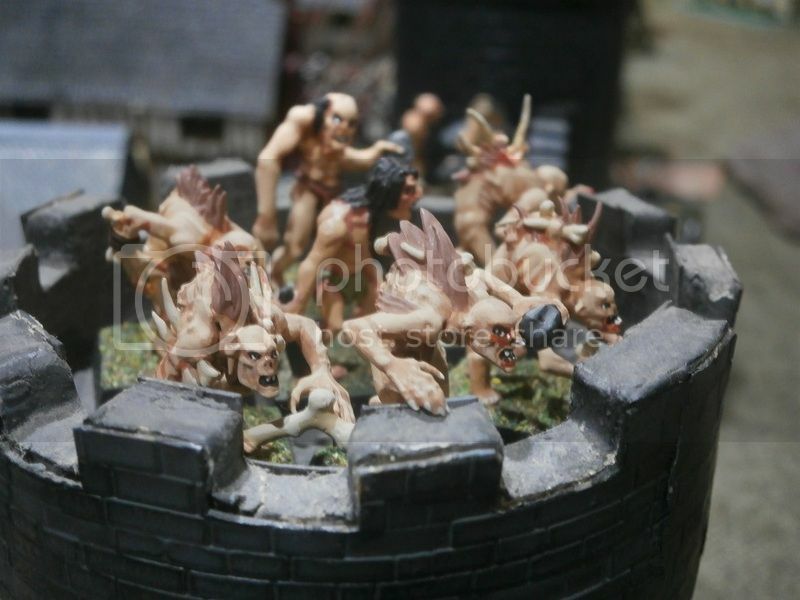 Three more flagellants perished as a consequence of their own carelessly spiralling frenzy, while the rest hewed through the last dozen zombies, and then without even a moment’s consideration, they hurled themselves at the wall, throwing up their ladders with abandon to begin the ascent. Their only thought was to fight some more. No matter how he tried, Silvano could not hurt the re-raised champion. 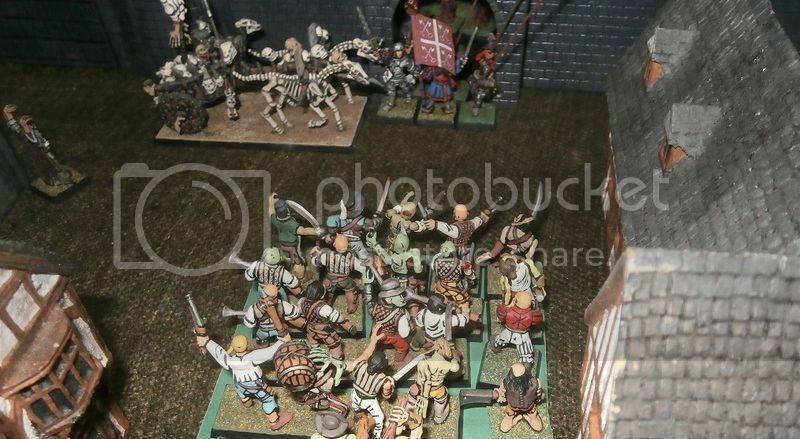 It did not matter, though, because with the halberdiers and ogres attacking all around them, the last vestiges of the magical force holding the skeletal riders in this began to weaken, and several riders crumbled to the ground. Surely the stubborn champion would also succumb soon? The two remaining crusader cannons had begun to concentrate their fire upon the tower between the gate and the southernmost stretch of the eastern wall. Ball after ball plunged into the stone, each one visibly weakening the structure, until it leaned precariously backwards, looking like a stiff wind could knock it down. 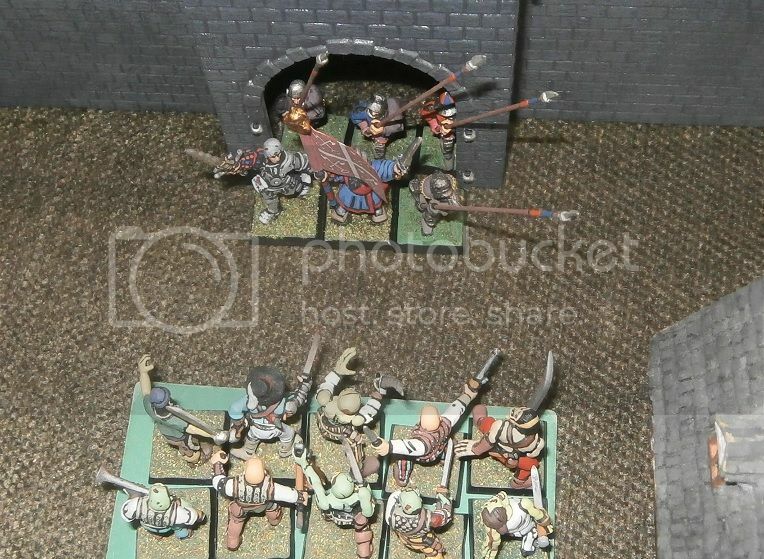 The Pavonan swordsmen near it slowed their pace almost to a halt, each man amongst them praying that it would fall soon and so grant them a way into the city less deadly than climbing the walls. 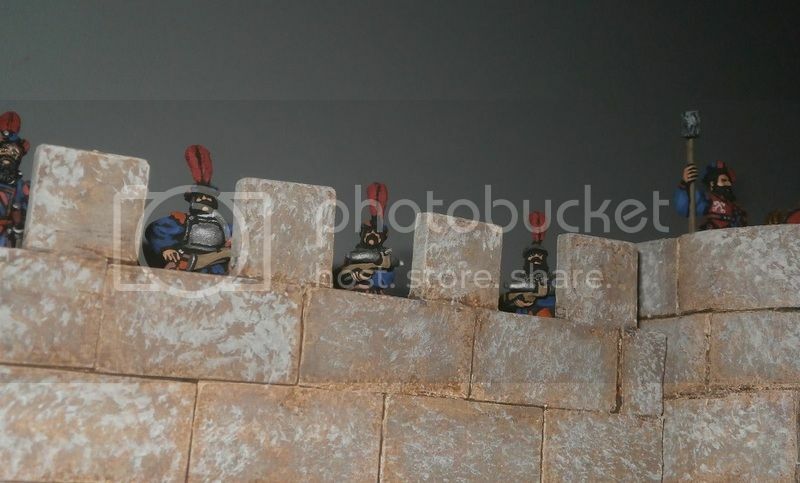 Meanwhile the Estalian pike regiment had formed into a column of three and began emerging into the city proper, their battle cries echoing off the grey stone. Directed by Master Leoni, the volley gun crew loaded, cranked, levered and then triggered the firelock ignition to blast once more, this time blowing apart one of the undead brutes on the parapet above the gate. The other brutes failed even to flinch at their comrade’s violent demise, merely watching as more and more of the pikemen streamed through the gates below them. 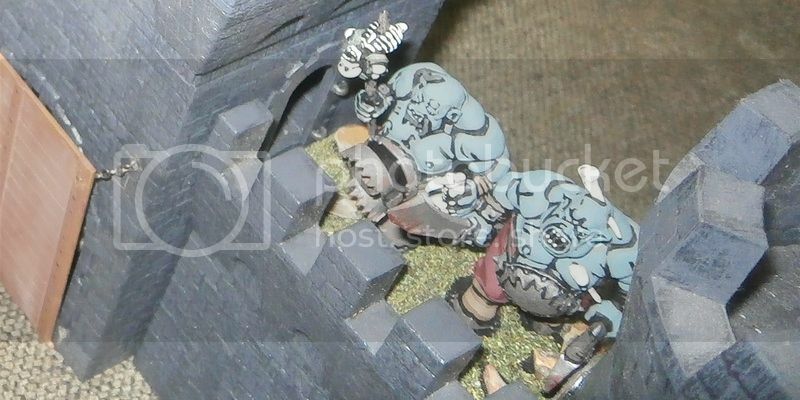 The Pavonan lord Silvano Gondi was struggling to best the bony champion, distracted as he was by the need to regain control of his terrified mount (what with ogres to one side and walking dead to the fore). So he breathed a sigh of relief when the champion and the last remaining riders finally fell. Lord Adolfo’s sustaining magic had withered away completely, for the simple reason he was not even looking their way anymore. Instead his attention was turned to within the city, where both his and his servant’s necromantic magic was pouring forth to animate and re-animate zombies, skeletons and even the undead brutes. The earthwork before the gate was now revealed to be a grave-pit as well as a defensive feature, for zombies clawed their way out of the soil to face the flank of the pikemen attempting to negotiate the gate. 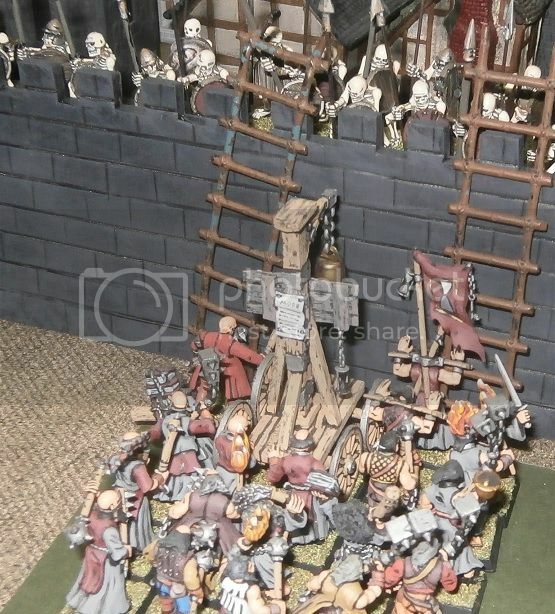 Very soon the flagellants, again at the cost of several of their own number (sacrificed to their spiralling frenzy) had cleared the wall of skeletons and moved to occupy the north-eastern tower, allowing the Cathayan halberdiers to clamber up onto the wall behind them. This meant that already three regiments of crusaders had penetrated the defences. 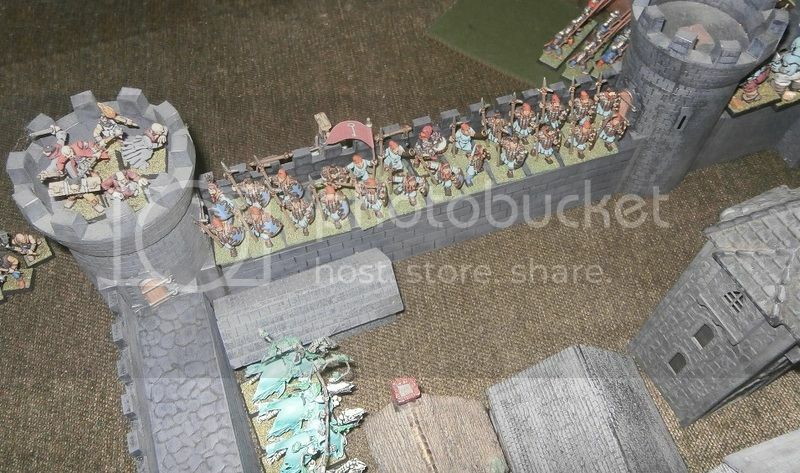 When the first Cathayans to arrive on the parapet looked down into the city, they saw that the ethereal riders had passed back through the wall into the city, to face towards the pikemen. 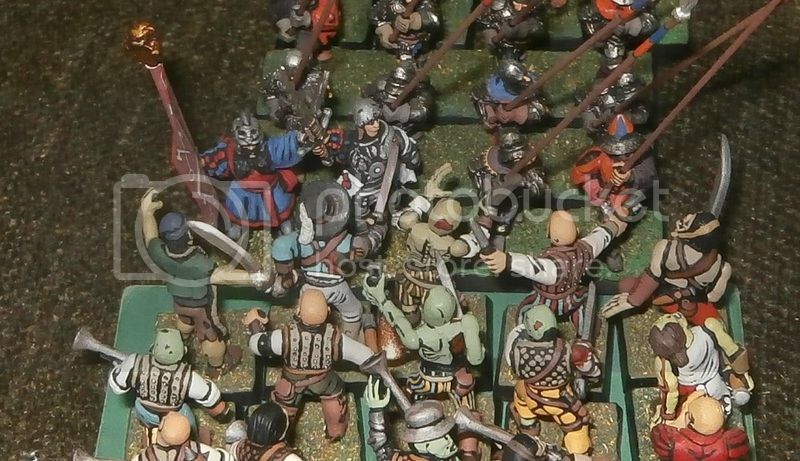 It was obvious that the hellish warriors intended to charge the pikemen, a move which could overwhelm them, especially as the pike were now engaged to their front with the growing swarm of zombies that Lord Adolfo was summoning. Fully aware of just how hard pressed the pikemen might find themselves, assaulting through the main entrance to the city, the Lector of Viadaza blessed them with both Morr’s Holy Protection (5+ ward) and Harmonic Convergence. Then, as Calictus II himself once again cast Morr’s murderous Caress upon the brute horrors, two more cannon balls slammed into the tower to the south of the gate and finally brought it toppling down. Outside the gate the zombies upon the earthwork were blasted from all sides – dwarfen pistols joined with the carroccio’s handguns, the steam engine’s swivels, as well as the volley gun. The twitching, broken, muddy remnants thus left on the earthwork were no longer any sort of threat. Three did stagger uncertainly towards the dwarfs but were cut down laughably easily. Not that the dwarfs felt like laughing! 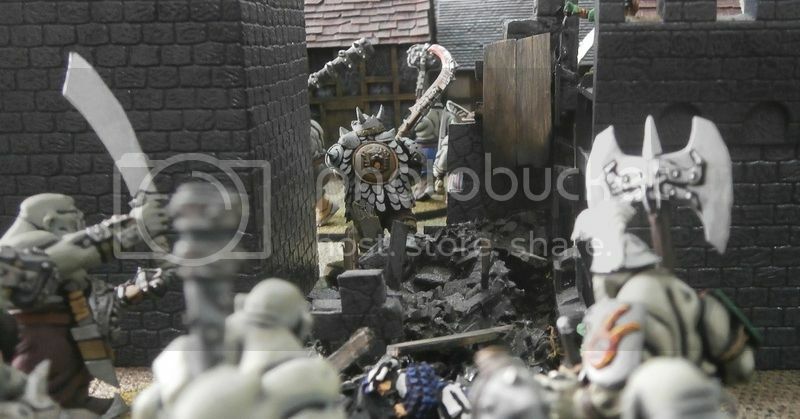 As the pike began a somewhat messy fight with the zombies inside the gate, the large body of skeletons manning the currently unthreatened southern wall now trooped down into the city, heading towards the fallen tower’s rubble remains. 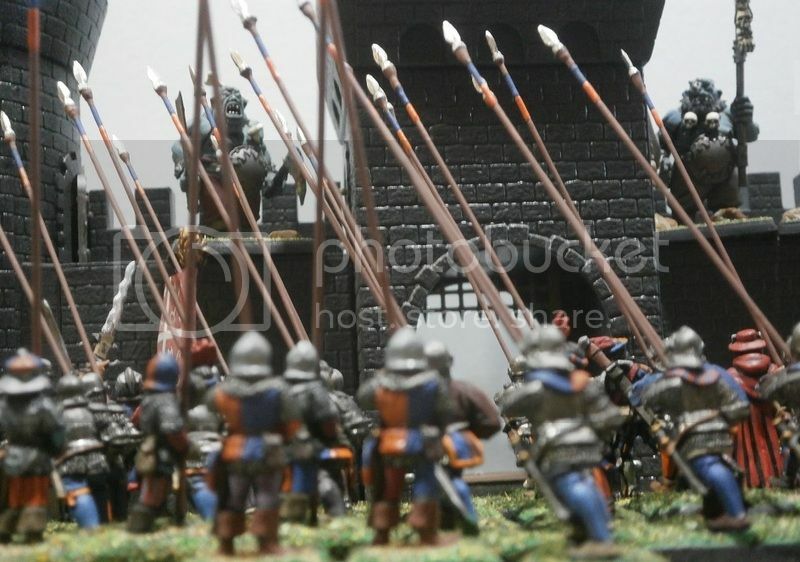 Lord Adolfo intended them to prevent anyone else entering that side of the city, hoping that thus the pikemen could be dealt with before anyone could come to their aid. The hexwraiths galloped silently down the length of the lane behind the northern wall to hurtle into the flank of the pikemen, immediately killing three with their cursed scythes. 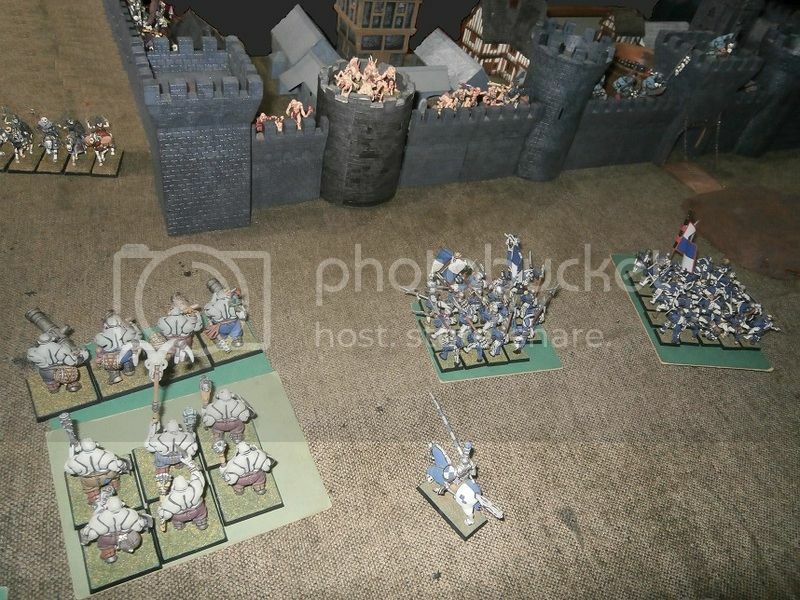 But the pike were still hacking at the zombies in front of them, hewing umpteen apart, and in so doing they shattered the magical forces holding both the last zombies and the hexwraiths. In a moment they suddenly found themselves facing nothing but heaped corpses, and with only two hexwraiths left to their side. The other ghostly riders had dissipated into faint wisps of etheric vapours. To the south of them there was a clattering sound as the Pavonan swordsmen came scrabbling over the ruins of the tower to join the Estalians inside the city proper. … and moments later the two bodies were locked in combat. 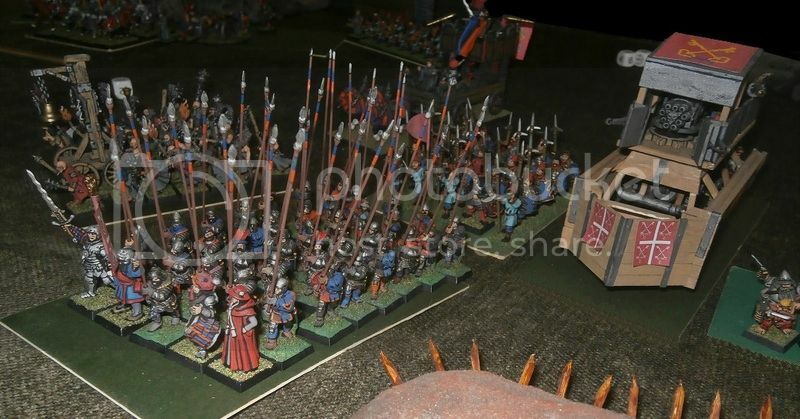 The sheer weight of numbers of pikemen meant the hexwraiths failed to inflict any significant damage at all, and when the last two also vanished from this world, the pike reformed to face the walls so that the surviving brutes still occupying them could not surprise them from behind. 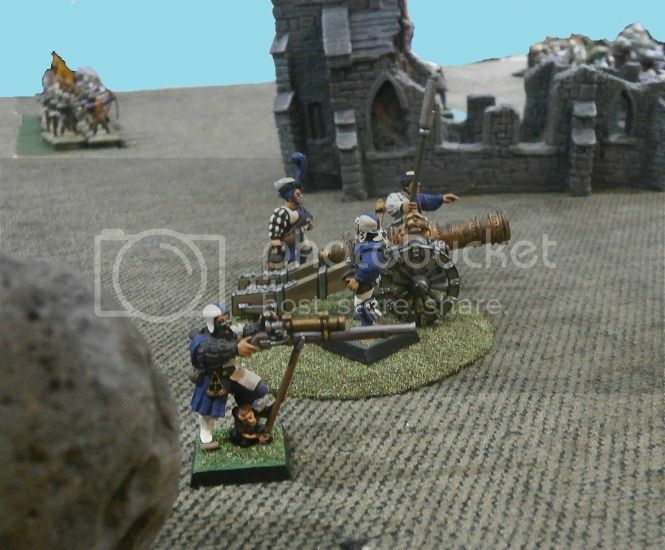 With little left to shoot at upon the walls it did not seem important that the crusaders’ next bout of missile fire, everything from cannon balls to arrows, inflict no harm at all. The Pavonan gun, fouled by the rapid firing, its crew exhausted, failed to fire, even with a skilled engineer tending it. The crew now took the opportunity to stop for a moment and study the walls. Their engineer peered through his Hochland Long Rifle sights, sweeping along the parapets to examine each one. As he did so he could see that the foe was now leaving the walls! The vampire lord let loose a terrible wail, so signalling it was now time to flee. He himself had already leapt across to the southern wall, while behind him the ghouls began leaping down to scamper through the streets towards the docks. Lord Adolfo leapt down to join them, quickly outpacing all the rest as he led them away. … while Father Biagino and the Cathayan crossbowmen glanced over to Generalissimo d’Alessio to see if he was going to signal victory. He did, and the cheers spread from field to wall to inside the city. Viadaza was retaken. The Holy Crusading Army of Morr had its first victory. Aside from the odd pike shenanigans, the campaign is a delight to watch. Thank you Padre for keeping the flame burning. "It is, it is a glorious thing To be a Pirate King." This is a true joy to see! The models are a delight upon the eyes and the campaign is truly inspiring! Well done, good sir, you are a credit to the community. To the vons Kurst and Klatz, thank you for saying. I am now a happy man, and feeling creative. This map will help with this part of the report. All places mentioned are outlined in yellow. One by one the companies of soldiers halted, forming their line about a hundred yards from the walls. It was as unexpected as it was unusual to most the populace of Remas, yet it was obvious that Captain General Duke Scaringella had been expecting them, for although the garrison was mustered upon the walls there was no sense of urgency or concern. The garrison were not rushing to defend the city because the army outside was not here to attack. The strangers looked more like soldiers on parade than arrayed for battle. The new arrivals were the famous mercenary army known as the Sons of the Desert, commanded by General Gedik Mamidous. To a man they hailed from the realm of Araby, beyond the Black Gulf. Every company wore its own particular style of clothes, none of them like the fashions favoured in Tilea. Individual officers strode out ahead of the rank and file, and as each body of men came up, they raised their hands to signal the halt, arraying the army into its line. They included a regiment swathed in black, their polished helmets and bright steel blades shining in the sunlight, their standard bearing the text of a vow in Arabyan, whose captain was clad in a coat hemmed in intricate silver lace. As they halted they drew their blades with a theatrical flourish, and gave a guttural cry that seemed half laugh, half curse. Another company, spearmen dressed in white linen decorated with red patches, bands, and the occasional shirt of mail, halted tiredly, their captain gesturing to their right to signal that they should dress up to the neighbouring body. As they did so their drummer beat a final flourish, rounded off with the clash of a pair of cymbals. The regiment to their right sported cloaks of silver-grey cloth and scale of a similar hue. They too bore spears, in their case viciously barbed. Once again their drummer neatly signalled the moment for them to halt. Before them was the southern gate of Remas, between two round-fronted towers, fashioned like the walls from huge blocks of stone. Reman soldiers watched from every gap in the crenellations, armed with crossbows or greatswords, while two brass cannon muzzles peeked over the top of the gate towers. Almost every garrison soldier sported a red plume, atop clothes of the arch-lector’s orange and blue. Many were Tileans, too, Remans born and bred, for the traditionally mercenary army of Remas had marched, almost to a man, upon Arch-Lector Calictus II’s crusade against the northern vampires. Yet they looked like ultramontane soldiers, their hair and beards cropped in the fashion favoured by the Empire mercenaries. It was a style that had become de rigour amongst nearly all the arch lector’s palace guard, and had now spread to the newly raised native troops. Duke Scaringella had already ridden out of the gates, accompanied by a small body guard. A mounted herald in traditional dress bore the cross-keyed colours of the Reman Church of Morr, whilst announcing the general with sharp blasts of his brass horn. 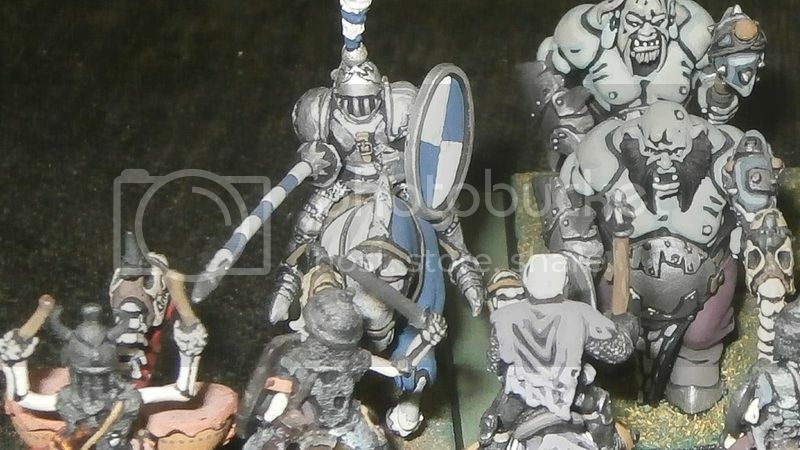 A small troop of armoured pistoliers stood off to his left, while a Morrite priest bearing the holy relic of Saint Salladro’s forefinger (the very same finger he laid upon Hagblood’s tongue) encased in silver and mounted upon a staff. The duke wore full armour, his horse brightly caparisoned in painted barding, with matching lance and a shield bearing the keys of Morr. As he was here to talk, to welcome, he wore a smile rather than a helm. Those who looked closely could see it was the rather fixed expression of feigned good humour, faltering as he flinched whenever the horn sounded. 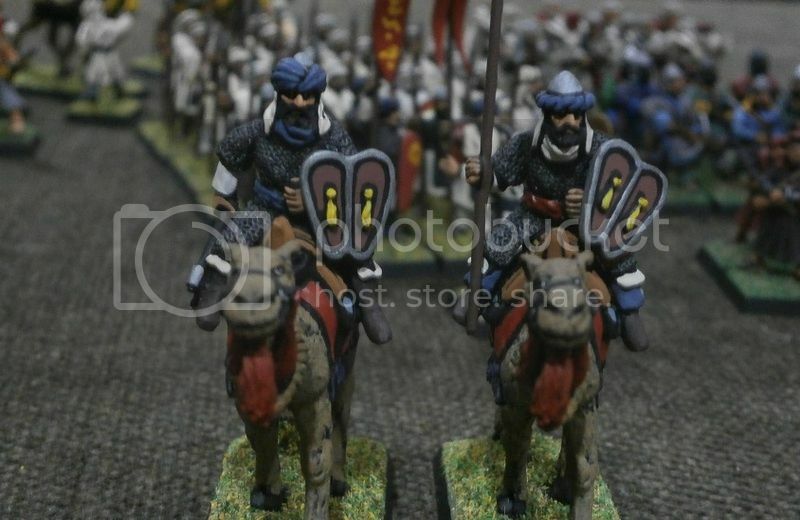 The mercenary General Gedik Mamidous was atop a camel, also accompanied by a standard bearer, although in his case the body guard behind him was an entire army. He wore unadorned chainmail and clothes of plain blue and white plain, appearing every bit a fighting soldier. The only decorations he carried where the silken tassels upon his shield, and that was a fashion shared by several of his camel riders. Before Duke Scaringella could begin his formal welcome address, the arabyan mercenary spoke. “I know,” snapped Belastra. As if the arch-lector of Morr would or even could lead an army of crusaders in an attack against a living town. It was preposterous on every level: the crusaders would surely refuse such a command, the arch-lector’s reputation would be ruined and he would be turning his back on the real danger. Then Belastra suddenly turned pale as he remembered how Viadaza had fallen to the undead in the very same week that its own brave, crusading army was victorious in battle, killing the vampire duke. Had the vampires played the same trick again? Had they outflanked the arch-lector? Were they already south of the mighty crusading army? Belastra went from befuddlement to sickening understanding in an instant. Of course it was brutes. 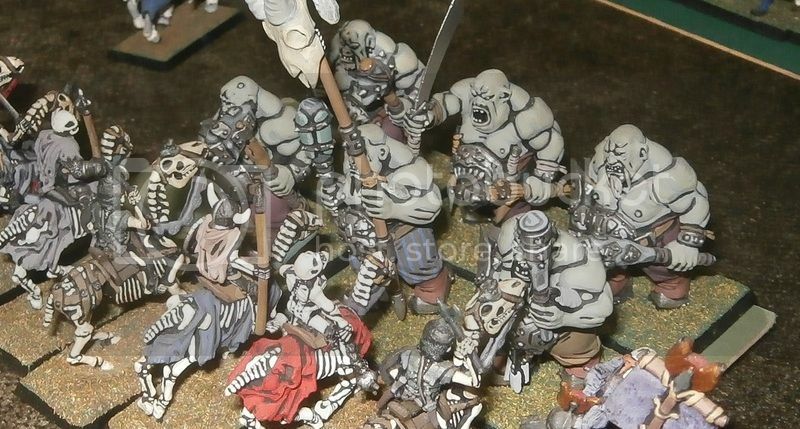 There had been reports of a large force of ogre mercenaries on the Via Nano, perhaps even the infamous Mangler’s Band, come through the mountains from the Border Princes. Country folk from the northern reaches of the Trantine Hills had arrived by the score at the city seeking refuge from the monstrous army. But when the scouts returned to report there was nothing there, he had presumed all the fuss was merely the consequence of twisted rumours. He had said so much to Lord Silvano: the sighting of some caravan guards had been bloated into an army; the tale of a tavern brawl grown into a battle. He had waxed lyrical about how it might be compared to smouldering hay fanned into a fire, or a child’s account of snarling kittens twisted into an adult’s tale of sabre-toothed tigers. Lord Silvano had laughed. He had laughed. It was not so funny now. Belastra felt light headed. This was all his fault. It was he who had advised the young Lord Silvano to leave Trantio, join the Reman crusade and take the army with him. What had he been thinking? Of course, he knew full well why he had acted so. With the young lord gone, he would rule in his stead, acting governor of an entire city state, ancient and famous Trantio. He had imagined a hundred ways in which to enrich himself, the opportunities tumbling over each other in their abundance. Young Lord Silvano had hesitated, asking what would his father think? After all, the duke had ordered his son to ensure Trantio was well defended, and not to be drawn easily into a crusade that did not need his aid, especially when there were threats enough all around, not only from the north. As Silvano worried, Belastra saw his chance slipping away. So Belastra had worked on the young lord with words of assurance and encouragement. His father would be proud of him, for he could make his name in battle. Not any battle, but holy war in the name of Morr. Silvano said something about his brother, his father’s terrible loss, how he was the only heir left, but Belastra pressed on with his persuasions: This is your chance, as prince of Pavona, a follower of Morr the king of gods, to show the strength of your faith. The Remans will see that you are blessed by Morr, that there is no schism or heresy in the Morrite church of Pavona, only truth and wisdom, and that they too should accept the ascendancy of Morr. Then the young lord said he dare not go alone, nor with only a petty force at his command. And again Belastra saw his chance slipping away. So he advised the young lord to take all he wanted. Do not be half hearted in the service of Morr, nor think it foolish to use what strength you have at your disposal to defeat that which threatens all of Tilea, not just Pavona. Your father would think you most remiss not to equip yourself fully for battle. He is not a man for half measures, and nor would he wish you to be. Yet Lord Silvano still wore an expression of concern. I can stay here, Belastra said - knowing the young lord was too young and naïve to hear the truth behind his words – I can stay here to ensure Trantio’s obedience. Just leave me some guns, and the garrison soldiers that were once Compagnia del Sole, and Di Lazzaro of course. He and I would hardly be welcome among priests for they fight with prayers not spell. You take the veterans with you, Pavonans all, who have fought for your father and your brother, becoming skilled in arms and afraid of nothing. Let the arch lector witness what they can do. Make him grateful for your aid. Have your own name and not just that which your father gave you. Belastra was starting to believe it himself. Silvano would thrive in war, like his father the duke (but not his brother), and he himself would prosper from all he could wring from Trantio. Duke Guidobaldo would not complain, for Belastro would make sure to fill his coffers too. There was enough in Trantio to enrich them both. Now, thought Belastra, all could be lost. If the Brutes came south to Trantio it would ruin all his plans: his reputation destroyed, the wealth of Trantio stolen, his life in peril from the duke’s anger. What now? Was there any way to salvage his honour, or should he look simply to saving his life? Belastra shook his head, as if to empty it of upsetting thoughts. He should not give up so easily. Great men, rich men, did not fall into weeping and wailing at the first hurdle. His end had not yet come, and he was still governor of Trantio. Maybe there was still a way to save himself, even to prosper? He held up his hand to silence the militiaman. “Who commanded them?” he demanded. The militiaman shrugged, a nervous spasm twisting his face like a stage buffoon. Ah! The crusaders are victorious, for the moment, and driven from the town, while elsewhere reinforcements arrive, and the Ogres advance. You are kind of correct, GP. I ought to attach maps of the regions to some of these reports. The Viadazan crusaders were victorious a while ago, but lost their city of Viadaza to the undead at the same time as they were away fighting! The (new) Reman crusaders, who include some refugee Viadazans, have been victorious in recapturing Viadaza and driving out the undead. 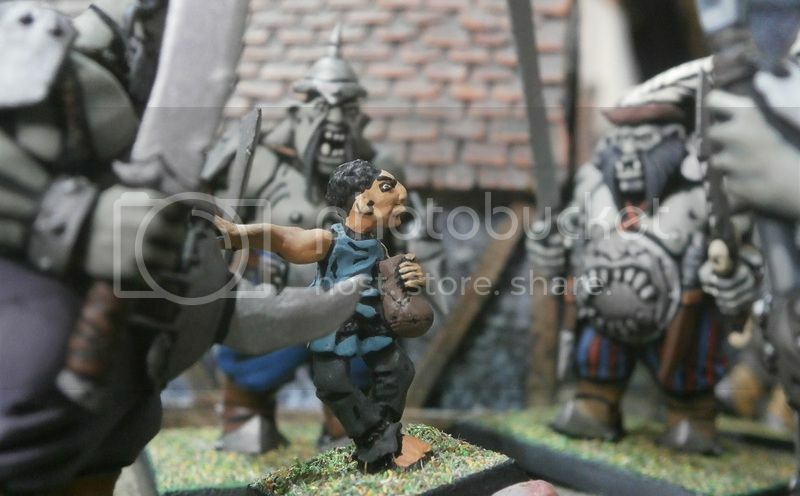 The ogres doing the attacking may or may not include 'Mangler's Band' but do seem to be led by Razger Boulderguts, the ogre tyrant lieutenant of the Wizard Lord Bentiglovio of Campogrotta. Which for reasons that should become clear as the general report unfolds, is quite unexpected. If I'd included a map in the post above, showing Remas, Viadaza, Trantio, and Scorcio, I reckon it would have made more sense. That explanation is helpful, and as a result I vaguely recall some of those items from before. Also, a cast of characters could be helpful, particulalry if it is in a seperate thread. That way it can be pulled up as a source of reference as the campaign continues. I can probably look these communities up on a map, and although posting one could be good, perhaps at the beginning of a cast of characters thread. I agree. Also if you could do put all your posts in one place for a quick and easy refference, it'd eb awesome (hint: blog ). Loving this stuff so far. I've inserted a map which includes (I think) the names of all the places mentioned in part one of the end of season 6 report (http://warhammer-empire.com/theforum/index.php/topic,46787.msg962116.html#msg962116). It's a game-world map, however, and might not show the exactly correct hex-distances etc. I wish now, although this might be mad, that I had done much more detailed, maps of each city state. I might yet do so as and when required, maybe for when I start doing WFRP adventures in this campaign too. 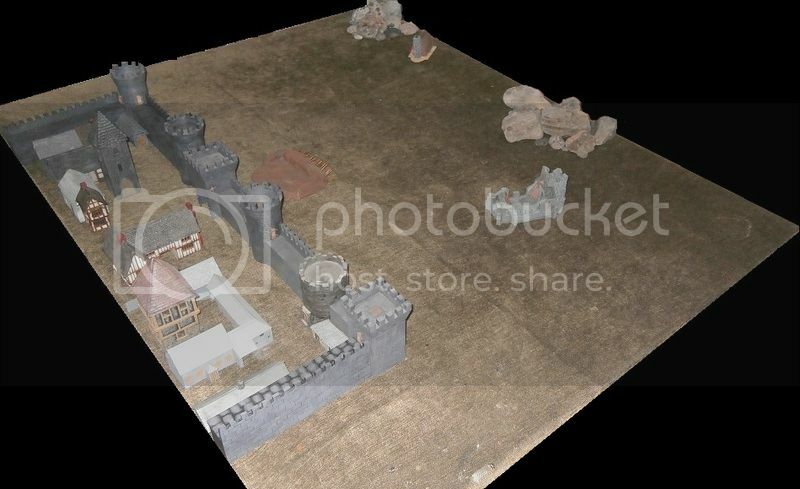 Maps were included near the start of the whole thread, during the 'recent history posts - see http://warhammer-empire.com/theforum/index.php/topic,46787.msg835246.html#msg835246 and http://warhammer-empire.com/theforum/index.php/topic,46787.msg835313.html#msg835313, both the same map, but slightly different sizes). I've inserted a map which includes (I think) the names of all the places mentioned in part one of the end of season 6 report in highlights. It's a game-world map, however, and might not show the exactly correct hex-distances etc. I wish now, although this might be mad, that I had done much more detailed, maps of each city state. I might yet do so as and when required, maybe for when I start doing WFRP adventures in this campaign too. You will do WFRP? As an avid RPG player I approve of that! Would be nice to read some logs after your game sessions. I checked the first post of this thread, yet didn't see a map. Then I began reviewing the first page of this thread and located the map in another post, yet recall seeing that one at the time it was posted. 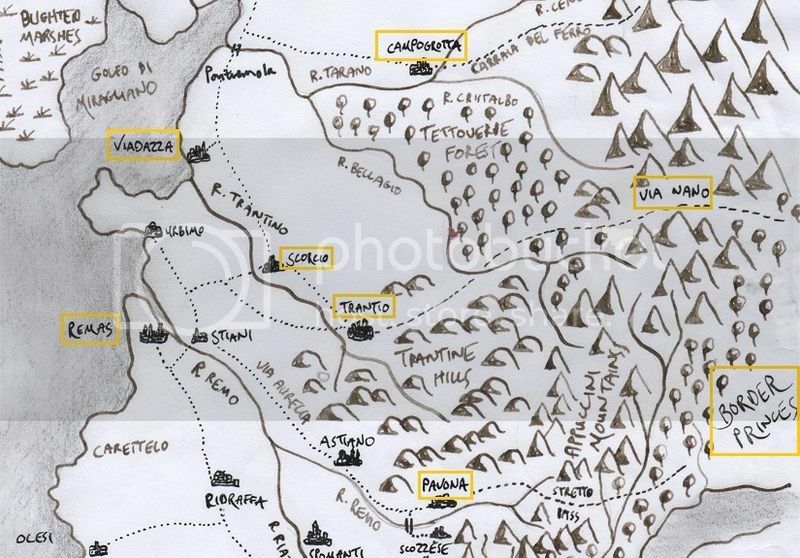 Then I went down through this page of the thread and found the map inserted at the beginning of the most recent story. I noticed there are a lot of characters through out this campaign event. There are a lot of characters, GP. It's the nature of the campaign, which doesn't work like a novel would as there are 6 players (whose characters I don't control, and whose private thoughts I cannot reveal nor even know) but there are plenty of Non-Player-Characters for me to work with, through which can tell the story of the campaign. Any of them could die at any moment (the table top games are out of my hands) but I do keep going back to certain characters recurrently. Several posts focus on Father Biagino, the Morrite Priest who fled Miragliano, then took part in the Viadazan crusade, now in the Reman crusade. There are also the two ex-Compagnia del Sole chancellors, Ottaviano and Baccio - they've been in a few adventures. I am hoping these will feature again, and again. I intend to return to the Dwarfen exiles from Pavona first encountered in Radraffa (http://warhammer-empire.com/theforum/index.php/topic,46787.msg836195.html#msg836195) too. Some characters I had high hopes for writing more about were snatched from me due to their demise. I thought the orc Sea Boss Scarback might last a bit longer, but I am hoping the goblin boss Gurmliss will. Some characters were creations of earlier campaigns (the 'Animosity' internet based ones) like the greenskins Hafdi, Toggler and Doodo. I just wanted to write about them some more. As the stories are told through the eyes and experiences of various characters, they are not 'the' truth, but what those characters believe. This makes the writing even more fun.